Six years ago we started this dream of ours. Seventeen months ago, I decided to share this dream with family and close friends by writing my first blog. Then, I really got brave and opened the blog up to the world. Scary! The whole adventure of building this home has been exciting and more overwhelming than we could have ever imagined. It has consumed our lives for the last year. We are ready for the journey of building to be over. We want to continue our dream . . . just dreaming in our own bed in our own bedroom in our own home. That time is almost here! The Painters worked the week of June 16. They finished up on Monday, June 23. They touched up all stained wood and applied a second coat of paint to all the walls. 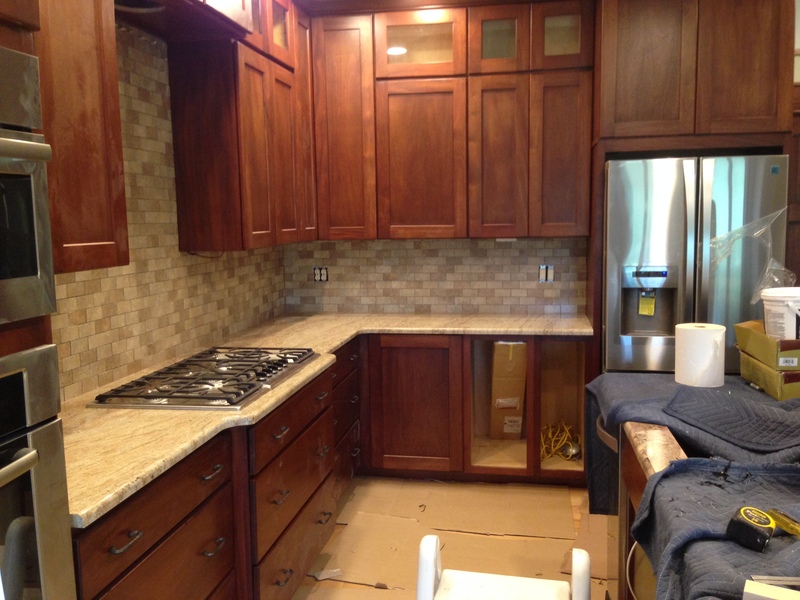 They also put another coat of paint on the pantry cabinet and laundry doors and drawers. They will come back to do final touch-ups after we move furniture in. They finally painted the exterior of the laundry room door the bronze color to match the windows. The plumbers worked the week of June 16, too. 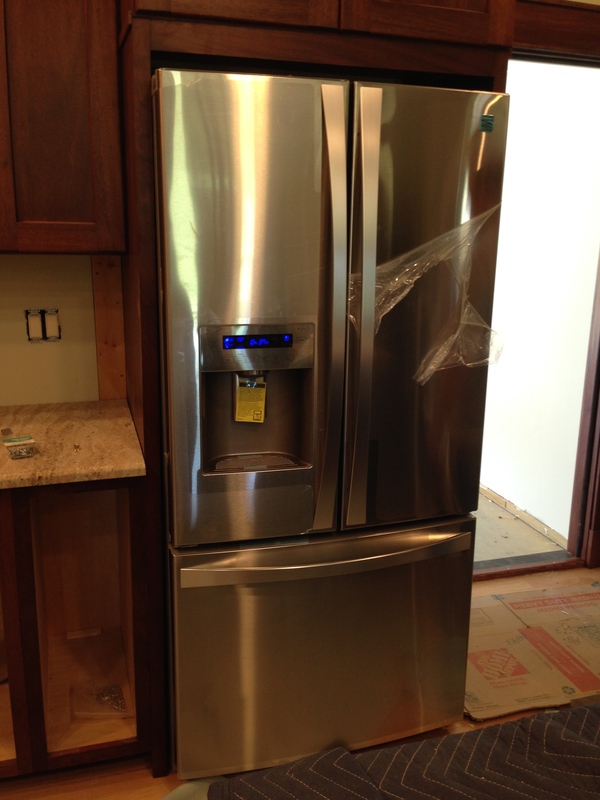 After they installed the line for the refrigerator ice maker, Bill decided to get the Kenmore Elite refrigerator we purchased over a year ago out of the box and get it ready so the plumbers could hook it up the next day. Panic quickly set in when he realized that the refrigerator cabinet he made was 3 inches smaller than the refrigerator we purchased. Big ol refrigerator that didn’t fit! Bill called me and kept apologizing for getting the cabinet size wrong. He felt horrible. He was ready to rip out the cabinet and try and remake it! I took a deep breath and calmly said, “Shut everything down and come up to Jill’s and let’s talk about it.” I’m telling you, the further we get into this construction, nothing surprises me anymore. I’ve found that getting upset doesn’t do much good. That doesn’t mean I don’t get upset here and there. But, this particular time. I did not. Jill just happened to be home from work and close by when Bill called. As soon as I hung up she asked what was going on. I told her and I said the last thing I wanted was for Bill to re-make a cabinet. We were too far to go back there. Besides, we were both sick of cabinet issues! 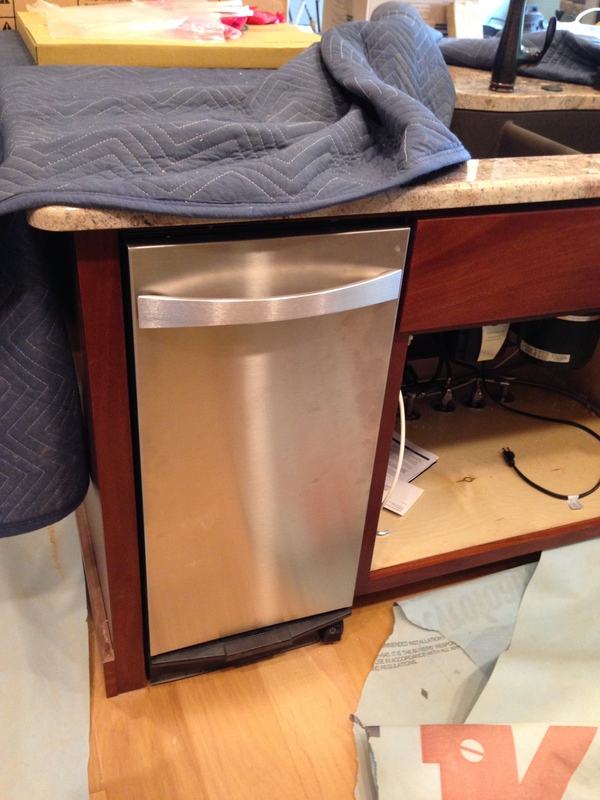 Jill said she thought we should just see if Sears would let us exchange the refrigerator for one that fit. Deja vu . . . another appliance return! When Bill came up from the house he looked so pitiful. We talked and I said we need to see if Sears will let us exchange the fridge. Besides, I was not that attached to that fridge anyway. Bill had really picked that model with two freezer compartments. I just liked the inside of the fridge section. Long story short and several hours the next day haggling a deal at Sears, we swapped out the fridge for a smaller Kenmore Elite model, paid a larger than we wanted re-stocking fee, purchased a second small fridge for the laundry room, and scheduled the delivery of the two new refrigerators and pick-up of the other fridge for two days later, Thursday, June 19. 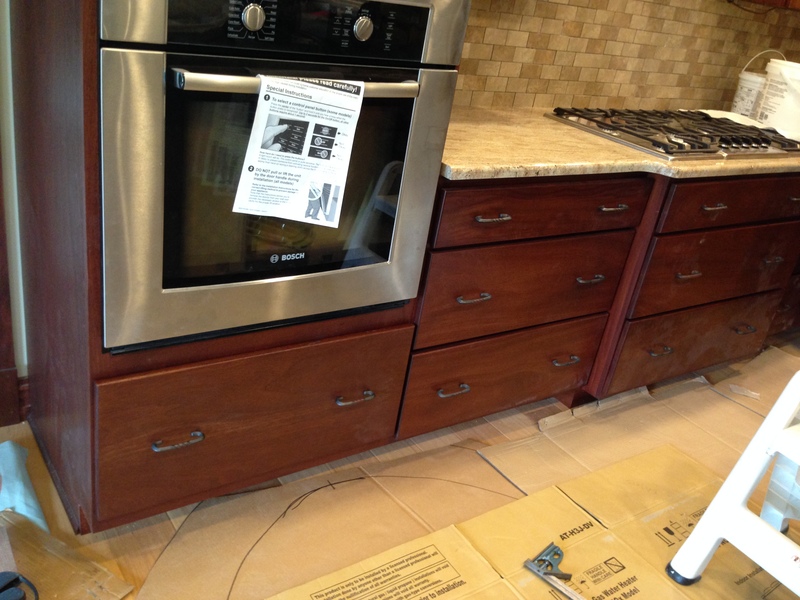 Let’s just say Lowe’s gave us a better deal than Sears on our appliance returns. If I had to do it all over, we wouldn’t have purchased any of our appliances a year or two in advance! Thank goodness all the rest of the appliances seem to be okay. 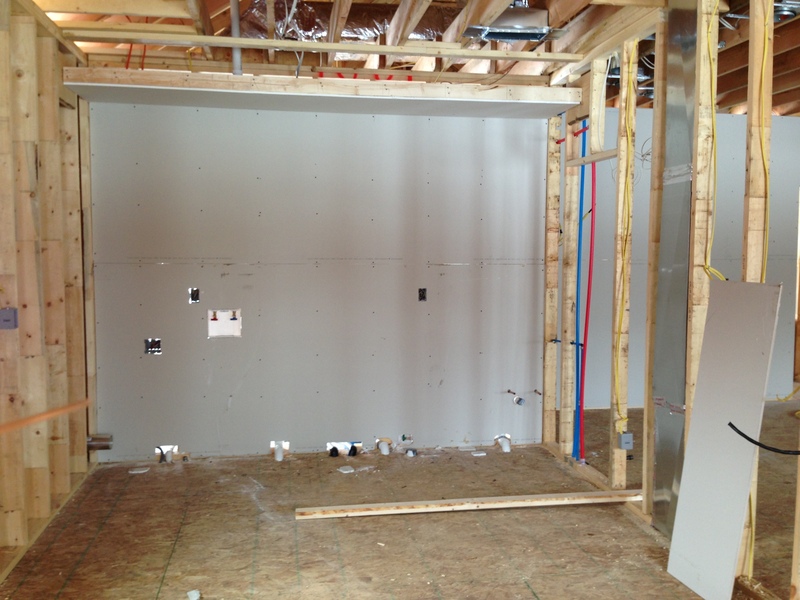 Here’s how one end of the laundry room is shaping up. 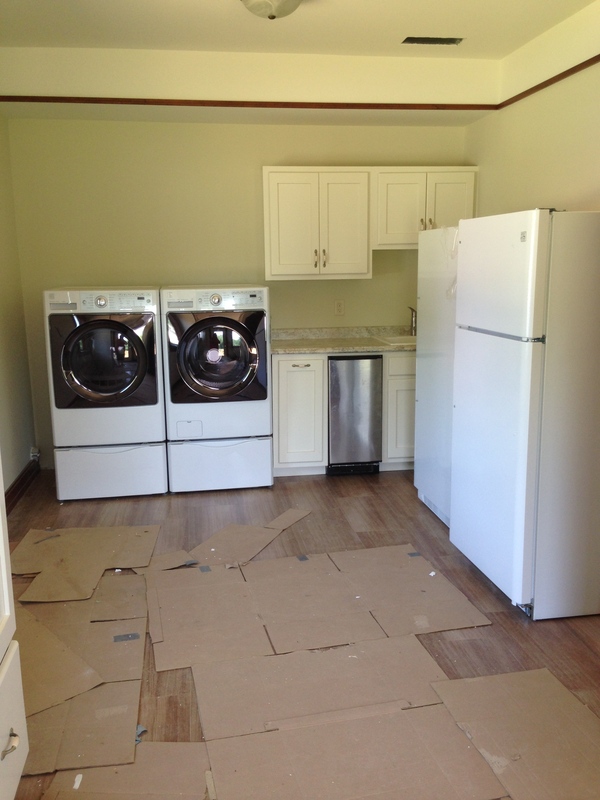 In the pic below the gas dryer is on the left and washer on the right. However, we are swapping them because of the door configuration. We can’t change the door on the washer but Bill was going to change the door for the dryer because I really wanted the washer on the right where it would be next to the pull-out drawer cabinet where I was going to store detergent and softener. But, it makes more sense for the doors to open up so I can move the clothes from the washer to dryer without having doors in the middle. 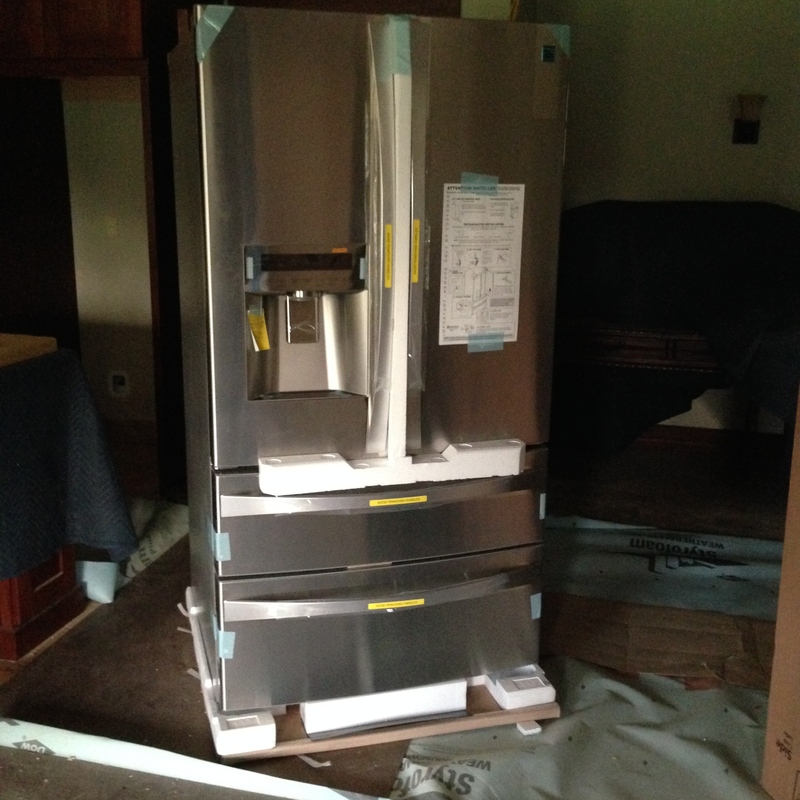 Bill will eventually change the door openings on both the freezer and small refrigerator. Bummer. Must not have told Sears which way we needed those opening. More jobs for Bill! 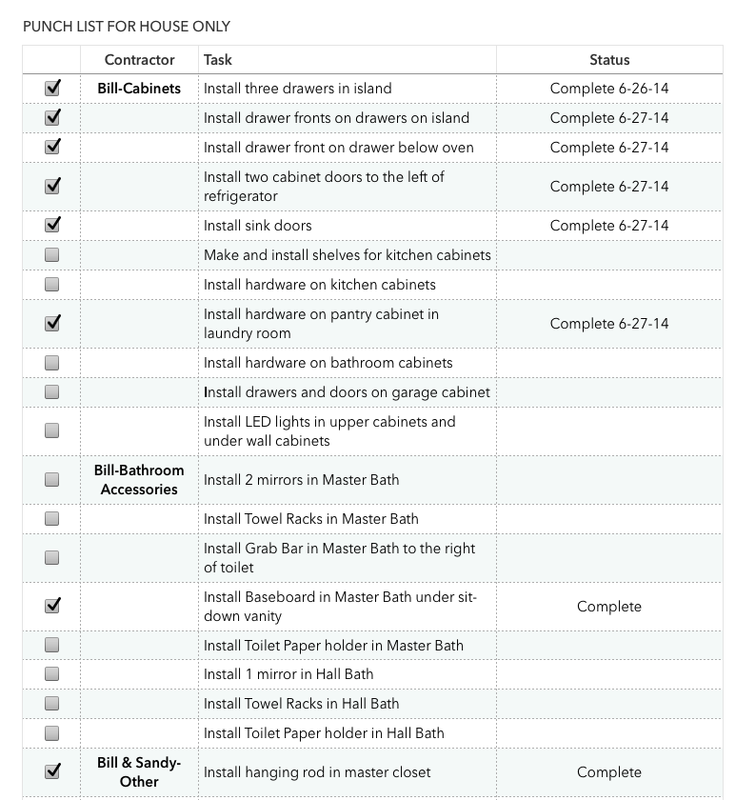 Speaking of jobs, shortly after the refrigerator deal, Jill and Jim asked me to get a punch list of everything else that needed to be done to complete our construction. They wanted to help us get a schedule set-up with a move-in date. This was a bit tense time as it meant listing everything that needed to be done, including all those PITA jobs assigned to Bill. Here is just a small section of what that list looks like. Right now it’s five pages long but it has all the subs listed and what needs to be done on the house only. Bill’s keeping what needs to be done in the pole barn in his head. It’s an ever-growing and ever-changing list. But, it’s been great to have it as it keeps us all on track. Originally, Bill wanted to know where my name was on the list. That’s why I added my name under that one section. I took over some of the scheduling of subs while Jim was out-of-town the first week. Jim took over the major contractors after he got home. Bill continued to have the day-to-day contact with the subs and answered all questions on-site. And, in-between, tried to work on his long list of PITA jobs. I think Bill needs his own crew. And, some of the things are going to have to wait until after we move in. 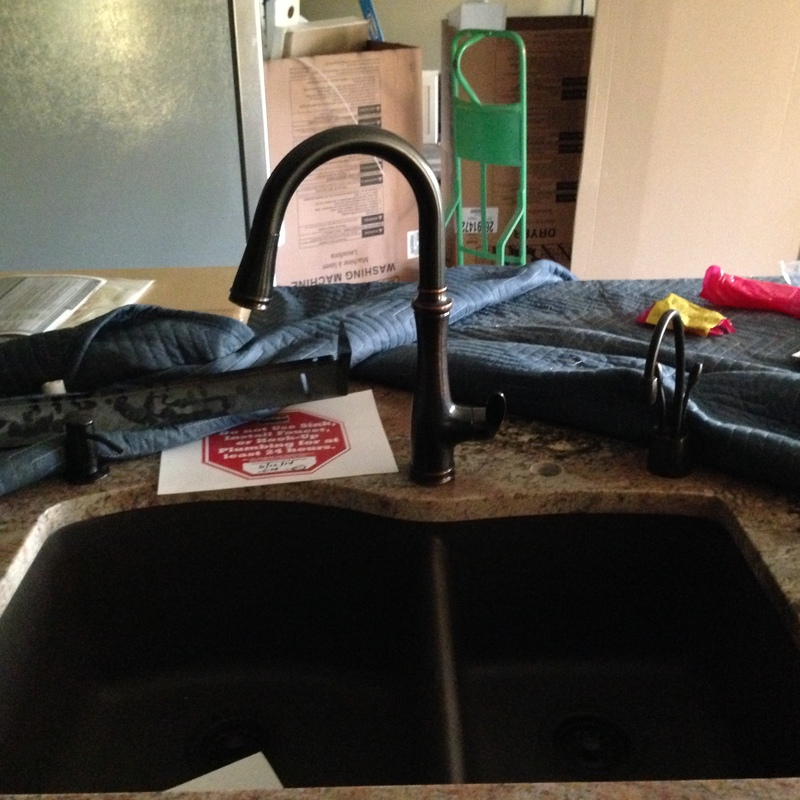 Here are some of the things that the plumbers got done. 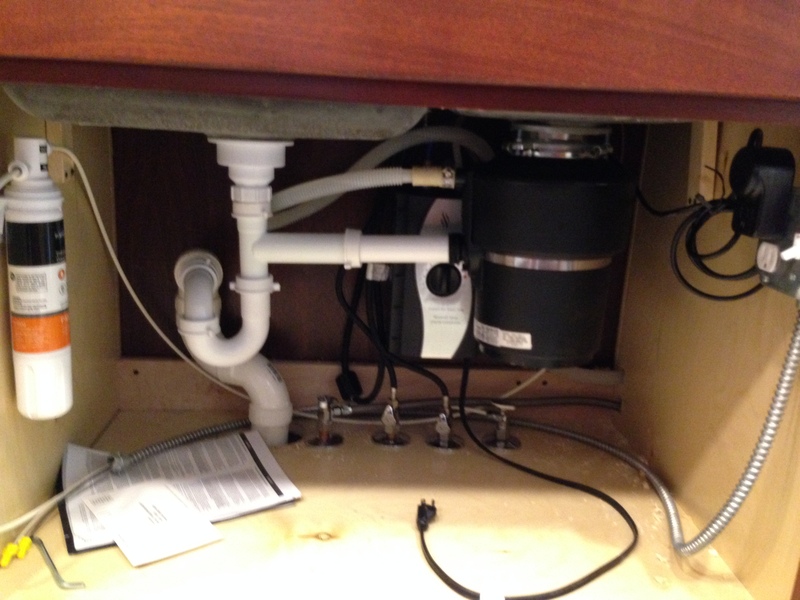 What they can cram into a small space under the kitchen sink: garbage disposal, instant hot/cold dispenser, filtering system, pipes and plugs. All the stuff under the kitchen sink! And, they installed our toilets! I had read on a forum that as soon as the toilets were installed, contractors start using them instead of the porta-potty. We didn’t want them to do that! Ewww. Heck, Bill and I weren’t going to use them since the septic laterals weren’t installed yet. 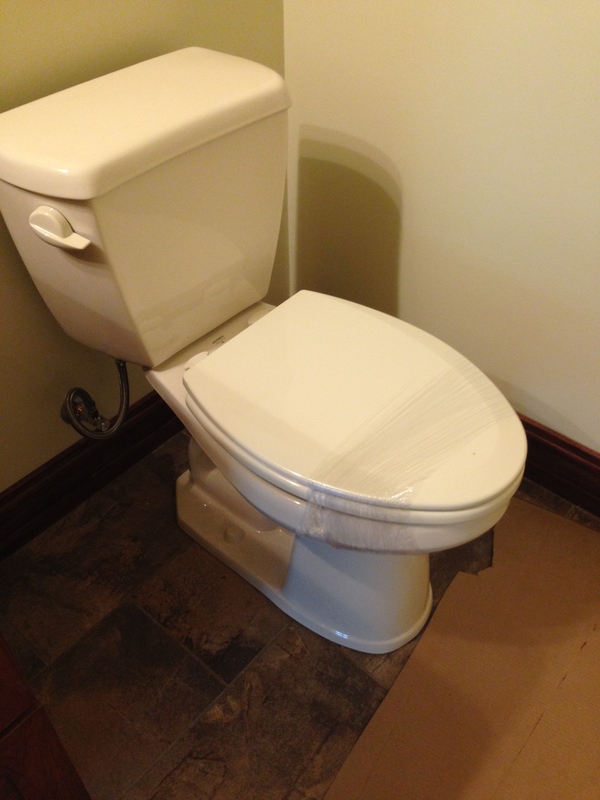 So, Bill shrink-wrapped the toilet seats! That Bill is so clever. And look what Bill has in the pole barn! 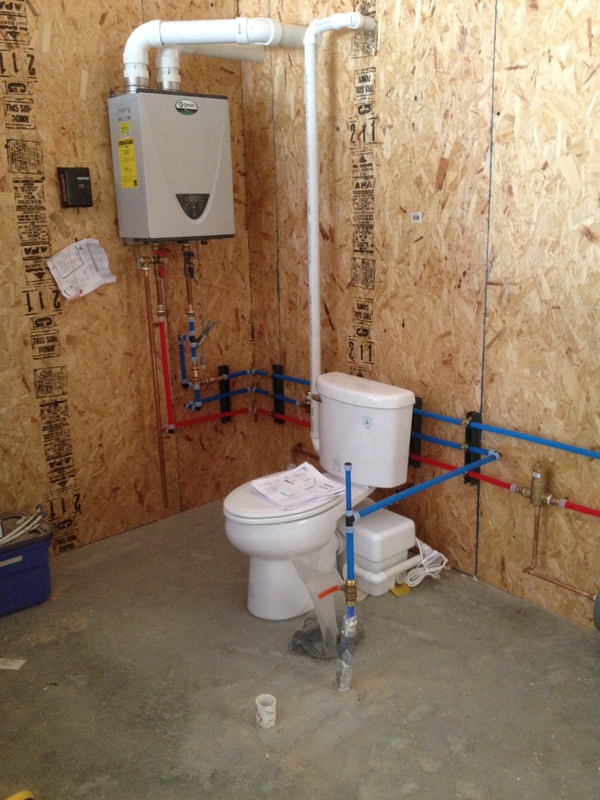 They hooked up his toilet and his hot water heater for the radiant heat. They have to wait until electricity is finished in the pole barn to finish the rest of this. Bill will be eventually installing walls around this bathroom. All the plumbers have left to do in the house is to install the handheld shower which was on back-order for over a month, install an extended gas line for the gas dryer move, and fix the reverse osmosis filtering system which is leaking and possibly not hooked up properly to the kitchen. We still have very sodium-lased water which we thought the RO system was to eliminate. We are also bringing in a water specialist to see if he can help us. Friday, June 20, we got excited because six loads of dirt were delivered. 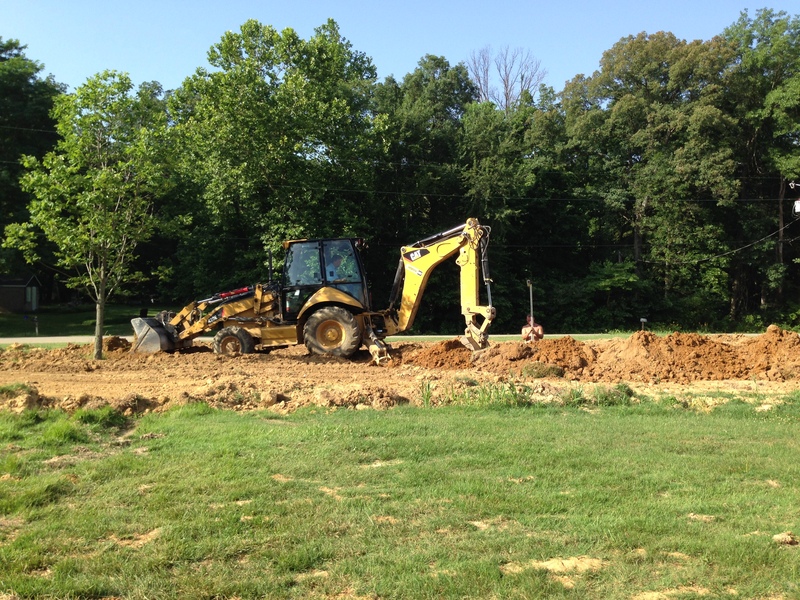 We thought that meant our excavator would be coming soon to install the septic laterals and do some grading. Sunday, the excavator worked and graded the area in the front of the house and the back patio area and left word that we could call the concrete guy to install the front walkway and back patio. But, no septic laterals. Sad. 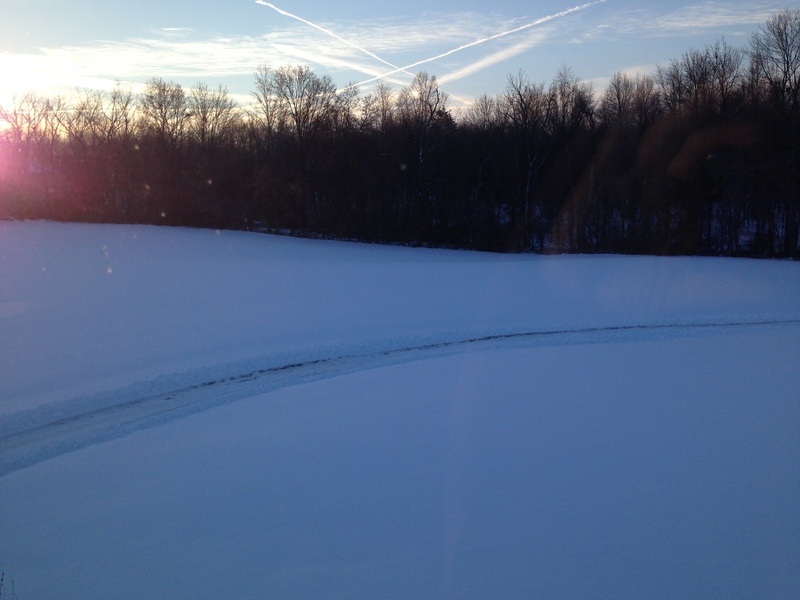 However, he talked with Bill about drainage pipes we would need to buy for the area between the house and pole barn. And, Bill wanted to buy all the stuff for the pop-ups from the gutter drainage that he was going to install. The week of June 23 was slow. More hold-ups for work. We needed electrician before any more plumbing could be done. The electrician was swamped. Bill called him on Tuesday that week and he said he couldn’t get to us until possibly the end of the following week but no definite date. Jim said he’d prefer us waiting on the concrete until he was back in town so he and his dad could make sure it was graded properly. 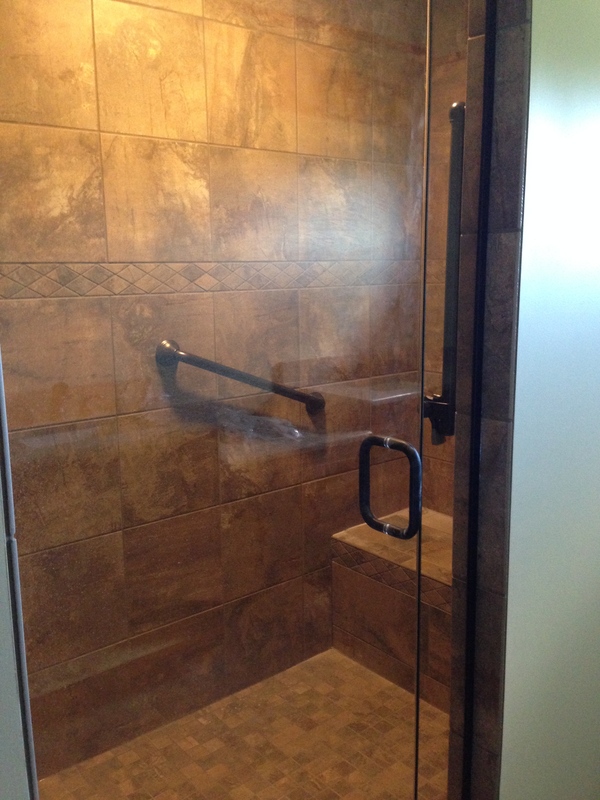 So, I scheduled David to come and install the shower glass door and the shower grab bars. I got his name from Ferguson’s (where we ordered the door). David had previously come out and measured everything and gave Ferguson’s the info about door configuration before we ordered it. David came Thursday, June 26, to install. And, the HVAC guys came that day, too, and installed ductwork in the crawlspace. They said they’d be back the next day or sometime the next week. They left us the contraption that had to be installed on the roof. It was silver in color. Bill wanted to spray paint it to match the roof. 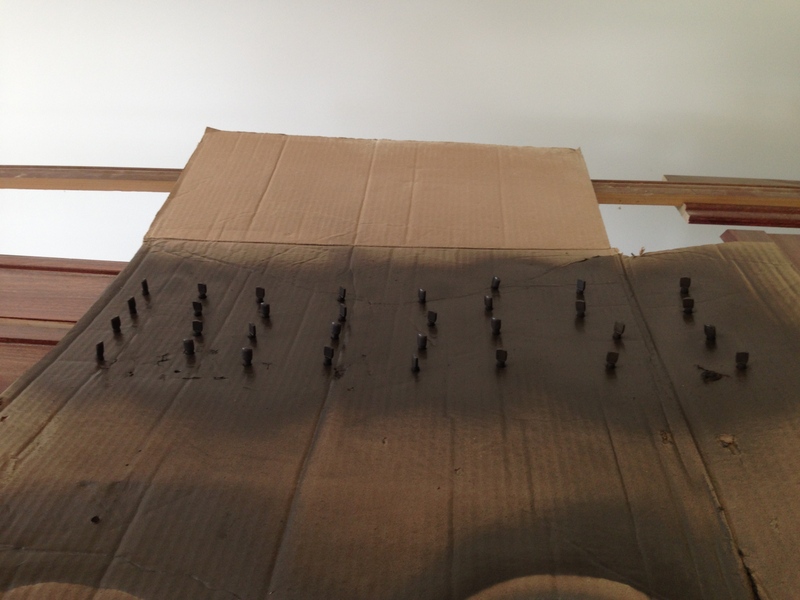 And, since he couldn’t find any bronze colored shelf pins at any store we looked at, he bought brass ones and said we could spray those, too, with the same paint. I kept asking Bill is there was anything on the list I could help him with and finally he said I could spray paint. Of course, Bill set everything up and stood and watched me as I painted. It took me less than 10 minutes to spray everything. I told Bill that really didn’t help him. Bill continued to work off of his list and kept finding more and more things that needed to get done. 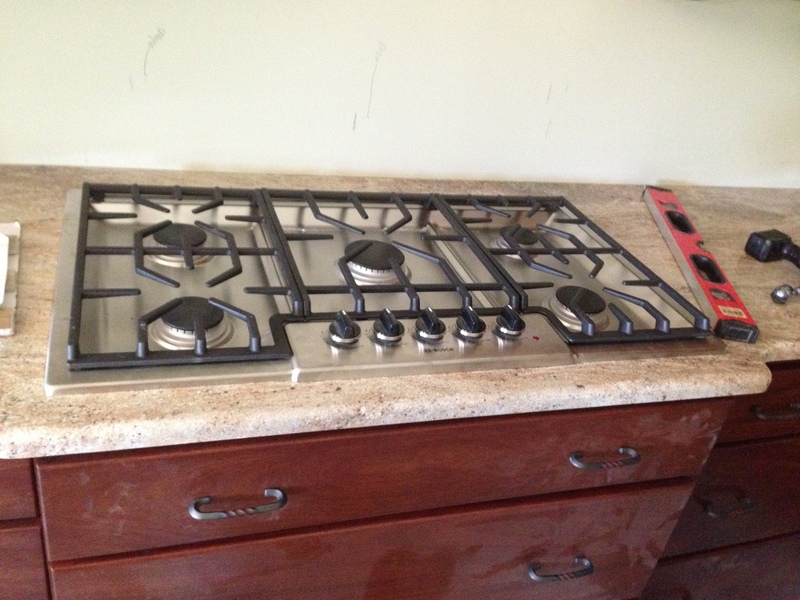 He installed the gas cooktop which he said was a bear! He installed the trash compactor. Unfortunately, the handle screws are too long that he has to cut them down eventually. It’s always something. 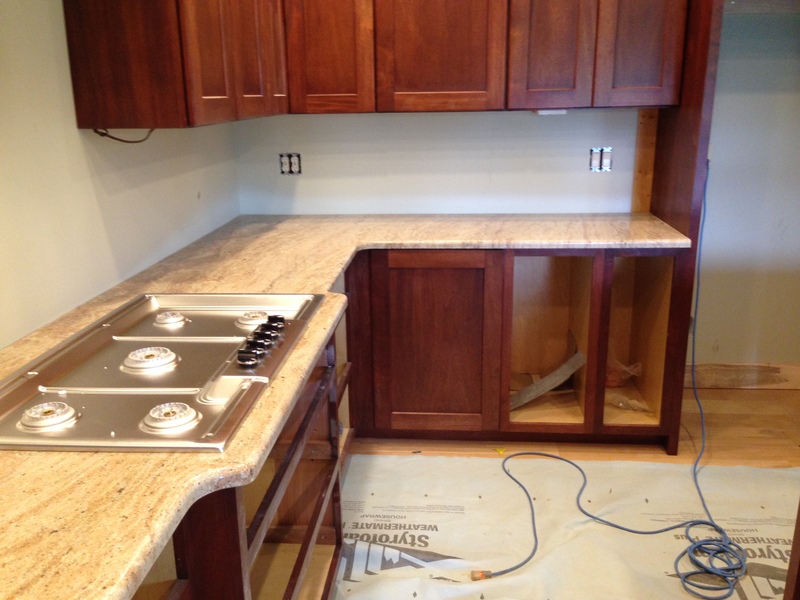 He worked so hard to get all the kitchen cabinet doors, slides, drawers, and drawer fronts installed. I was reminded several times a day that big honkin’ drawers are not the easiest things to install correctly and evenly especially with soft close slides. But, he did it!!!! 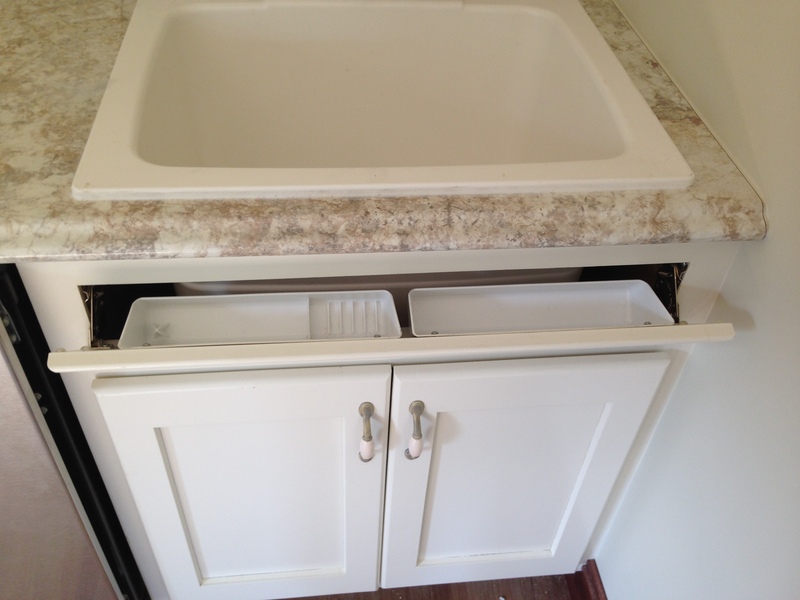 We decided not to put the tilt-out tray in the island sink base cabinet like Bill installed on the laundry sink cabinet below. However, Bill had already purchased the trays, so he installed one on each side of door interiors. When Bill started to make his list for all the drainage pop-ups and drainage pipes he needed to buy, he noticed that the downspouts that the gutter company installed were the wrong size. 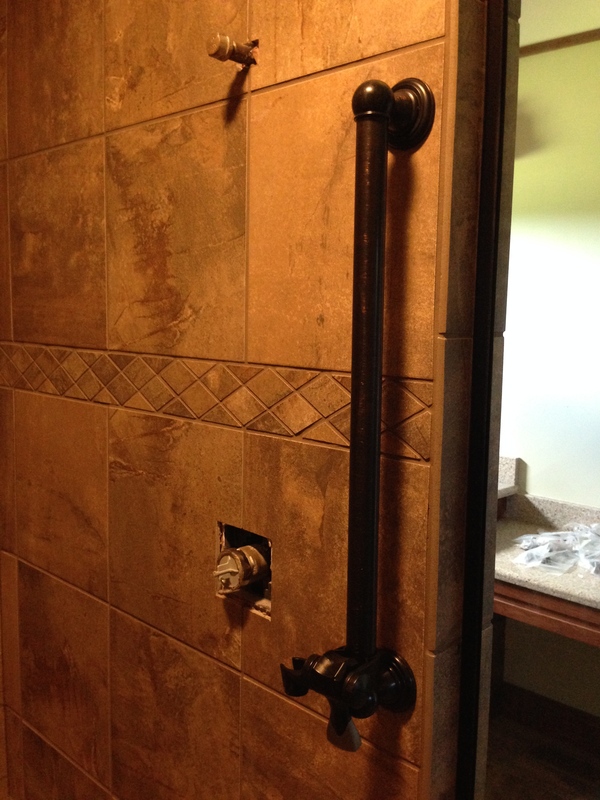 They had installed 3″ instead of the verbally requested 4″. Bill called the gutter rep and said he’d take half the blame, but he really wanted the 4″ downspouts as the 3″ clog up too much. 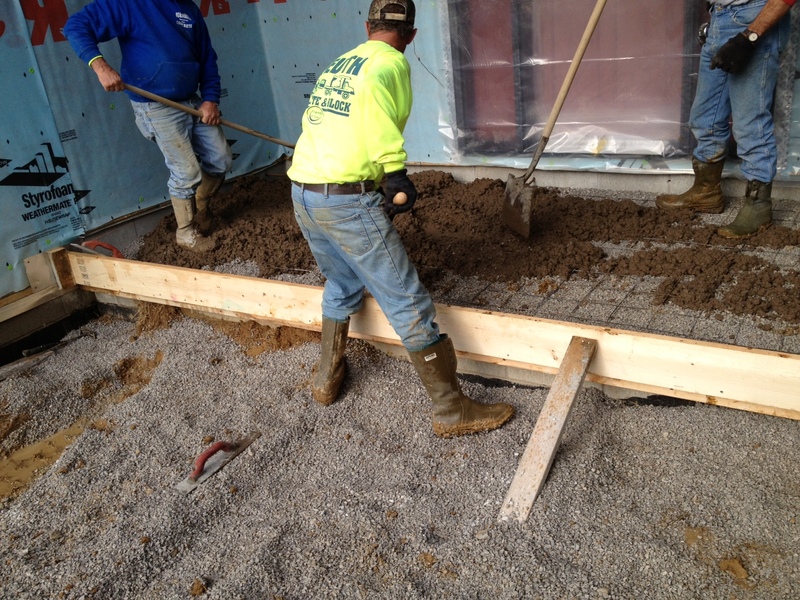 He asked that they be replaced prior to the concrete being poured. Those finally got installed on Wednesday, July 3. 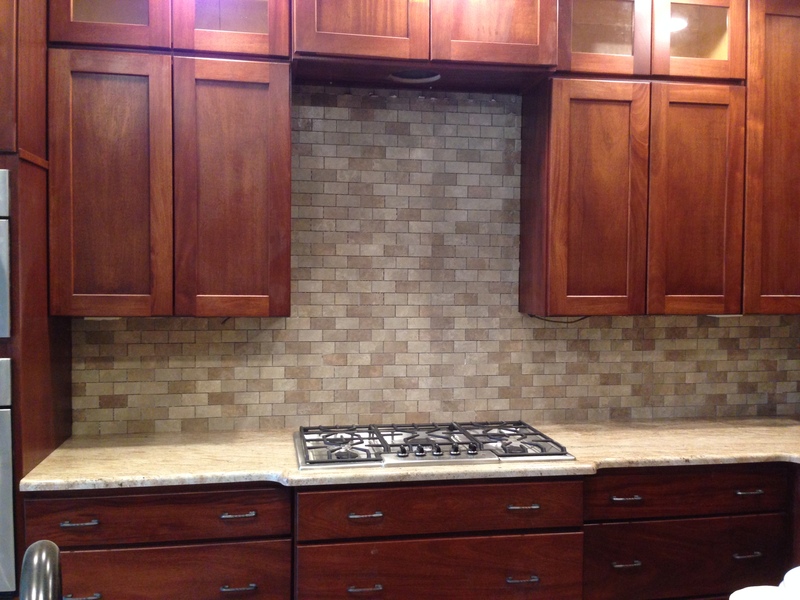 Bill scheduled our carpenter’s wife Lisa to install our kitchen backsplash tile. 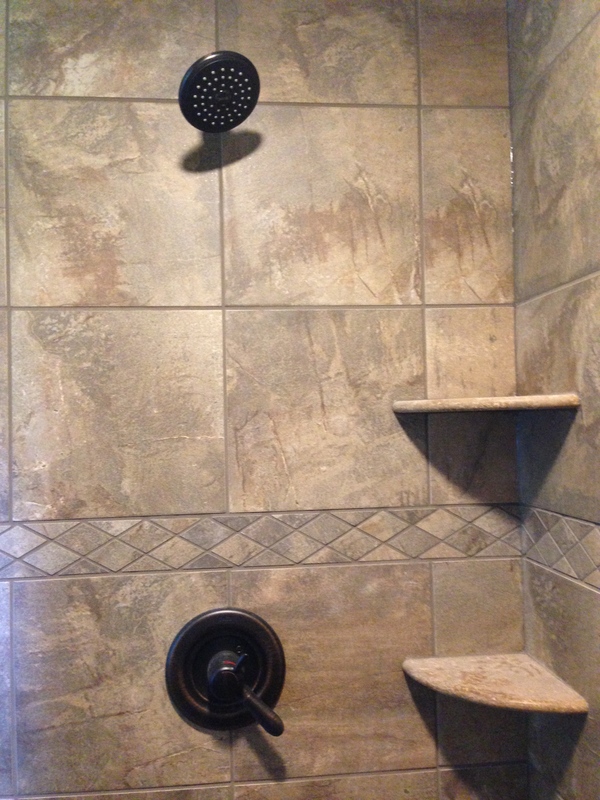 They asked us to purchase the tile and the grout and Lisa and Tim would supply the mortar, caulk and labor. 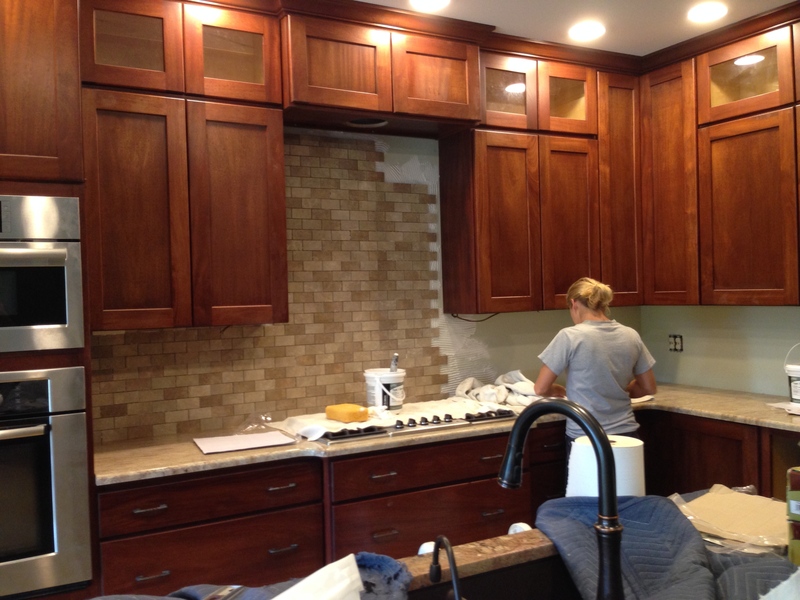 They started on the backsplash the afternoon of Friday, June 27. Tim came to help Lisa cut the tile but she did most of the installation. Lisa and Tim finished tiling Friday night as Bill worked on drawer fronts and I installed all the oil-rubbed-bronze window hardware covers and handles throughout the house. Lisa came back Saturday to grout and wipe down the tiles afterwards. Then she came back Sunday and put a sealer on the tiles and caulked everything. We are very happy with the results. At the beginning of this week we finally got all the subs lined up and committed to work on certain dates so we could make July 12 our official move-in date. We are keeping our fingers crossed that each one shows up next week and gets things done. This week went like clock-work so we hope it all continues. 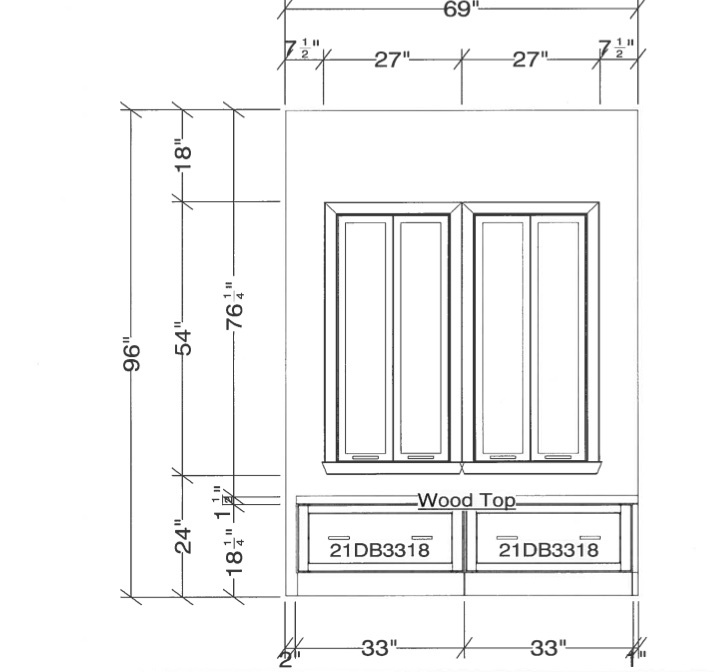 Monday morning, June 30, I contacted Rick about our bathroom cabinets. The doors needed to be aligned. They just wouldn’t shut correctly. And, the drawers in the hall bath were too close together and not opening without rubbing. Oh, and we found the tops to the window seats that he needed to pick-up. Rick came out that afternoon. 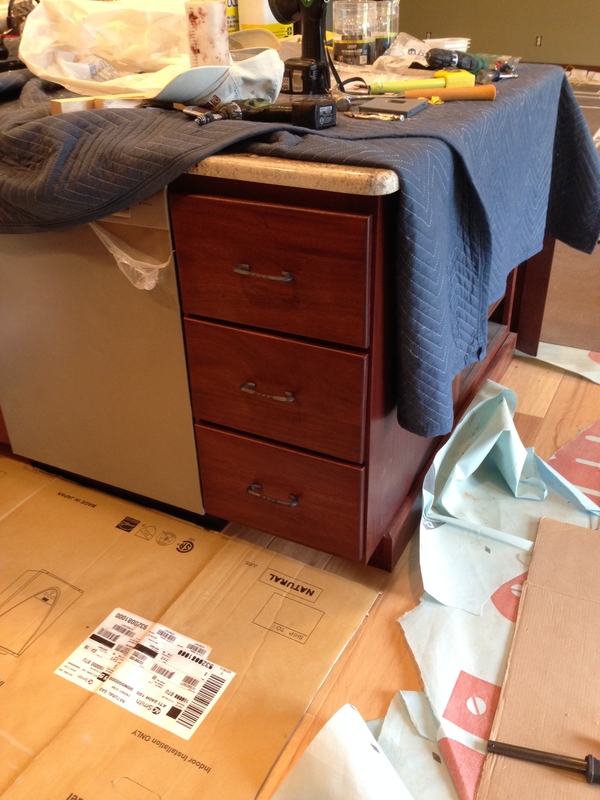 He was able to adjust the drawers (still not perfect) but not rubbing. He wasn’t able to fix the doors on either bathroom. 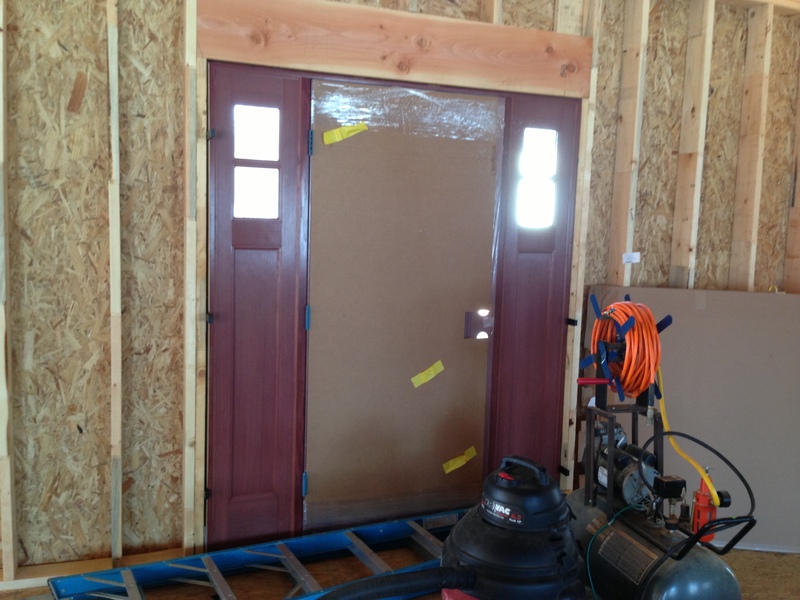 He said the doors were about 1/8″ too big. He ended up taking all six doors to our bathroom vanities with him to be cut down. I’ll have to check with him on Monday to see when he’ll have them back. 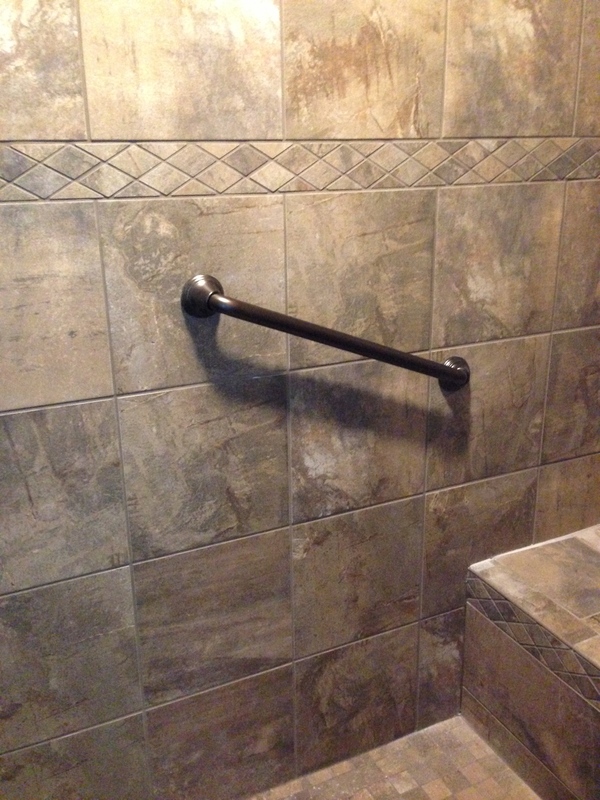 Bill wants to install handles and knobs in the bathrooms this week. 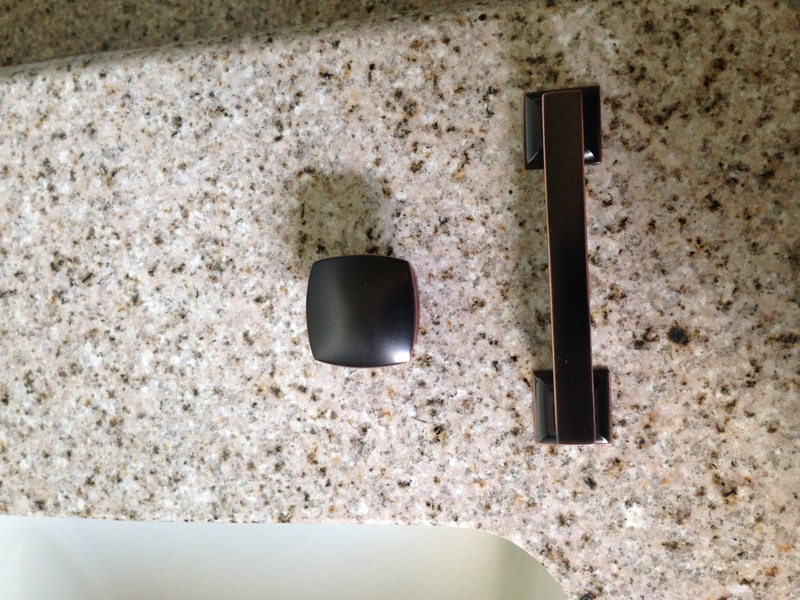 BTW, here are the handles and knobs we bought for our master bath. 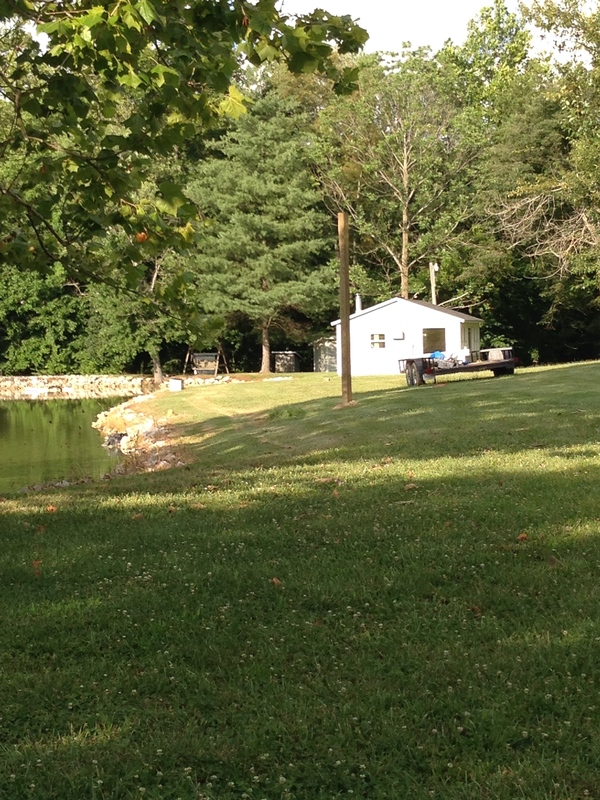 Poor Bill picked the hottest day we’ve had this summer to install a pole down by the lake. It was in the mid 90s with heat indexes over 100. That was a two maybe three shower day. He dug a hole three feet deep and managed to get that heavy pole in it and pour concrete to set it. He had electric run down by the lake and wanted the electrician to install an outlet on the lower part and a security light on the upper part. Bill also decided to call the dumpster people to pick it up and get it out of here. I had already scheduled our residential trash pick-up to start on Thursday the 3rd. So, he worked like crazy to crush all the stuff down with the tractor scoop. A neighbor brought over some junk to load into it. Bill even took apart the grandkids’ old trampoline that bit the dust after blowing away into the woods. All those pieces fit in there. And, Bill also cleaned out all the dirty chicken coop junk and plastic and got rid of that. Bill helps everyone out! 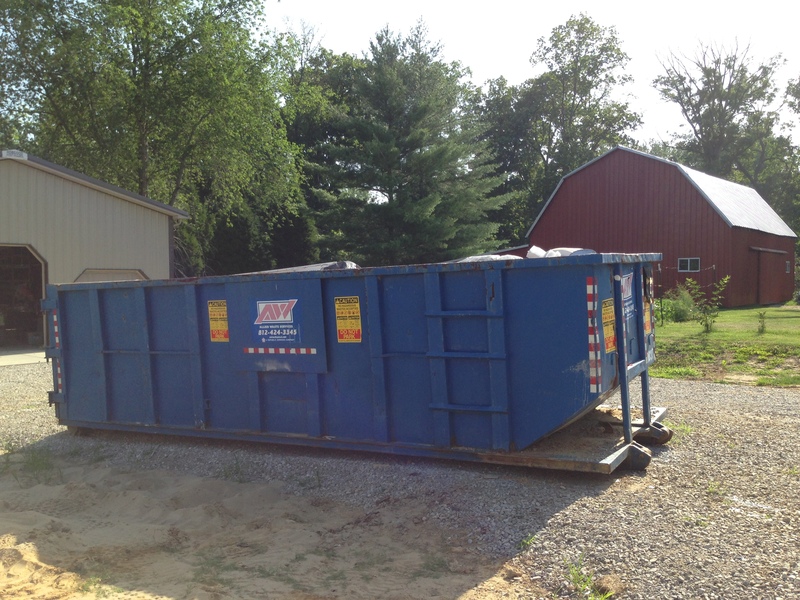 It was nice to say goodbye to this big blue container! And, now we can drive two cars up to pole barn without any problems. 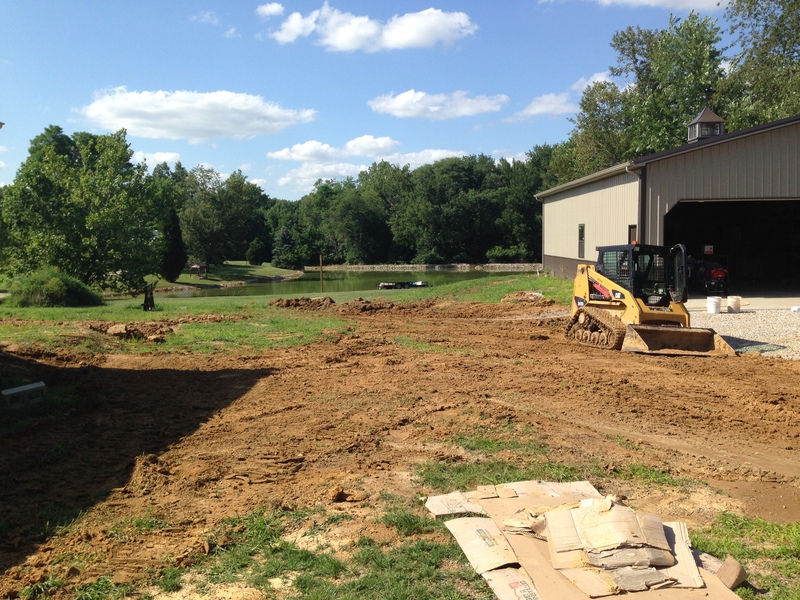 Bill also went and bought drainage pipes and fittings and pop-ups before our excavator came on Tuesday, July 1. Then he laid them out. Look at all those drainage pipes! Cha-ching! 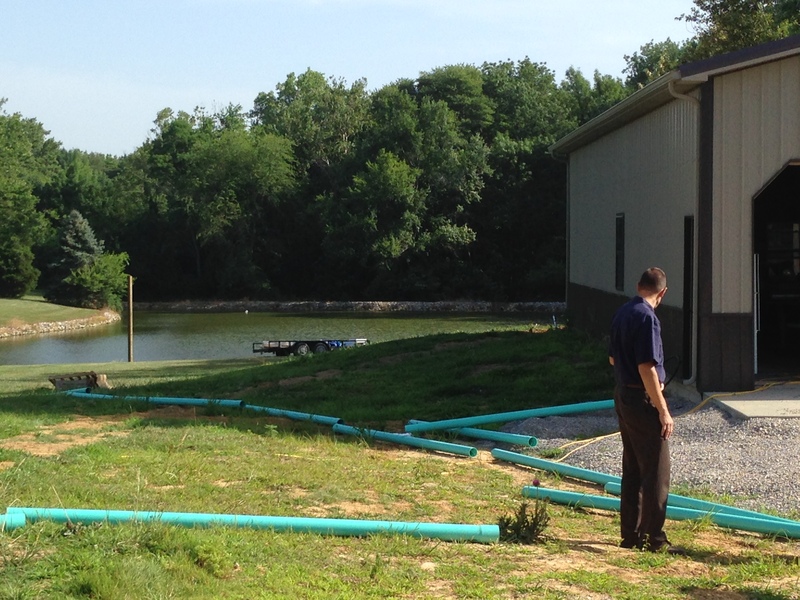 We finally got our septic laterals installed on Tuesday and passed inspection. Yahoo!!!! Thank goodness he was able to get that part done before a big thunderstorm rolled in that afternoon. The excavator did come back on Wednesday, July 2, and did some grading in the front of the house and buried the drainage pipes. Unfortunately, they ran out of pipes and Bill had to buy more, and then install and bury them. That’s how he spent 4th of July! 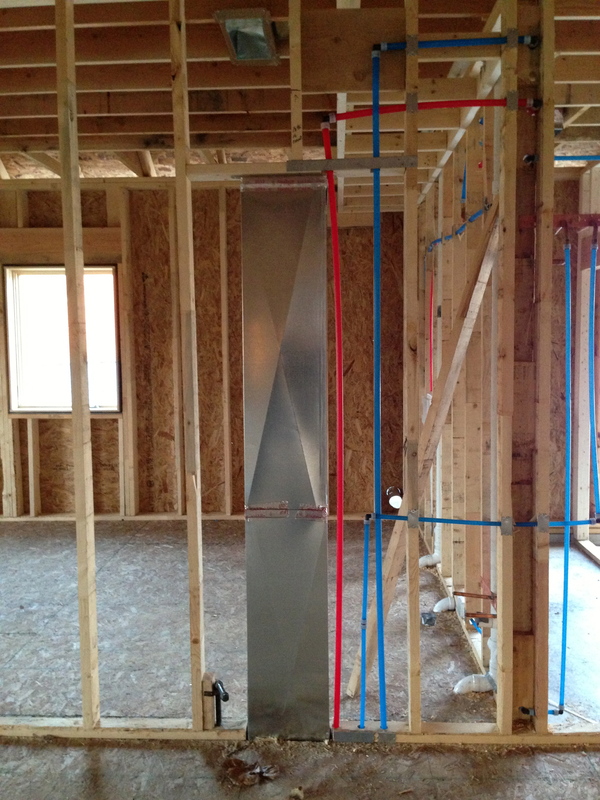 Our HVAC guys returned on Wednesday, the 2nd, to finish up. 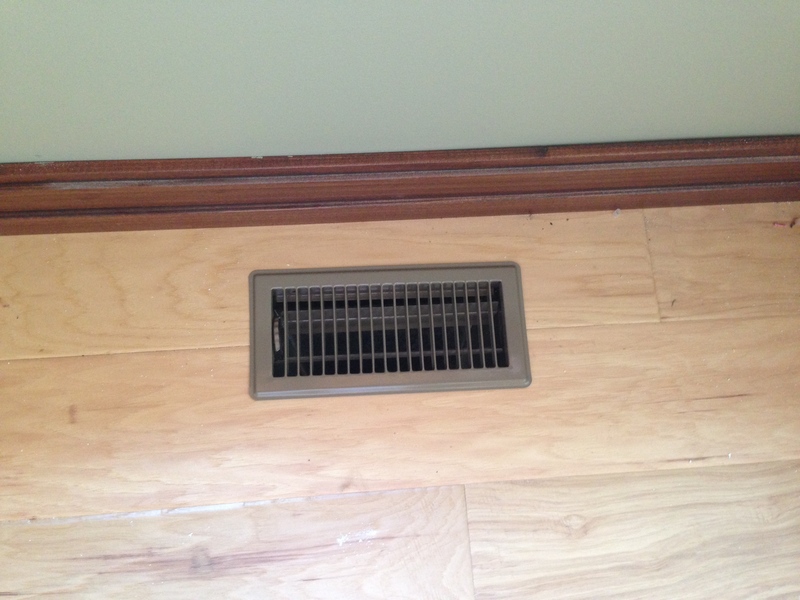 They installed the cold air return registers, but left us all the floor vents to install. That was something I could do! 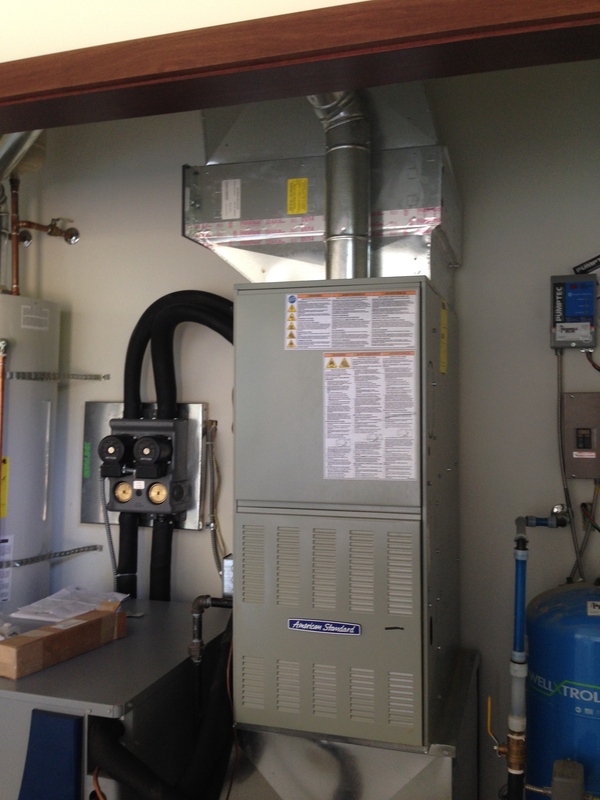 HVAC system all built and working! Oh, and as if Bill didn’t have enough to do, he worked off and on trying to get the stove exhaust fan installed so the HVAC guys could get it vented. He had such a tough time drilling holes in the tile. The HVAC guys said most people installed the exhaust fan first and had the tile installed around it. We didn’t want that look, but there was a price to pay for doing it that way. Drill drill drill. 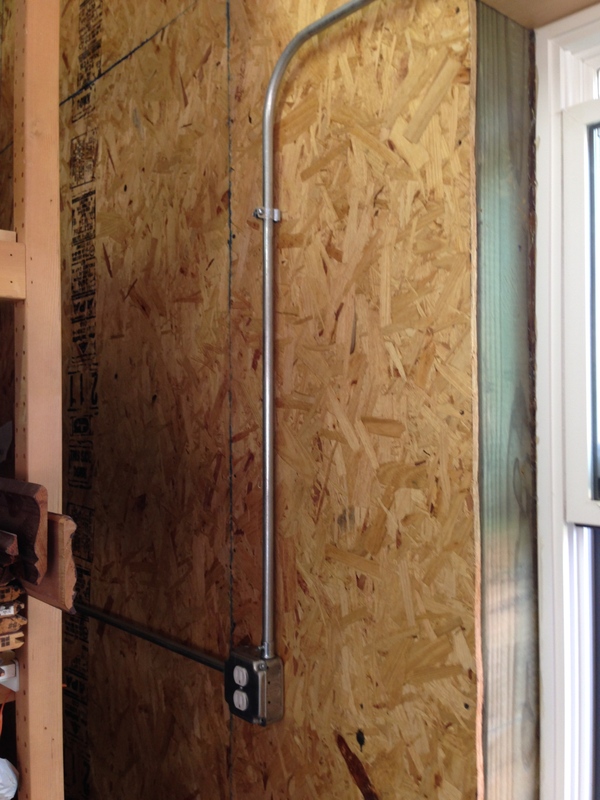 And, then when Bill got the exhaust fan hung up, it wasn’t level and he had to drill some more. Poor Bill! 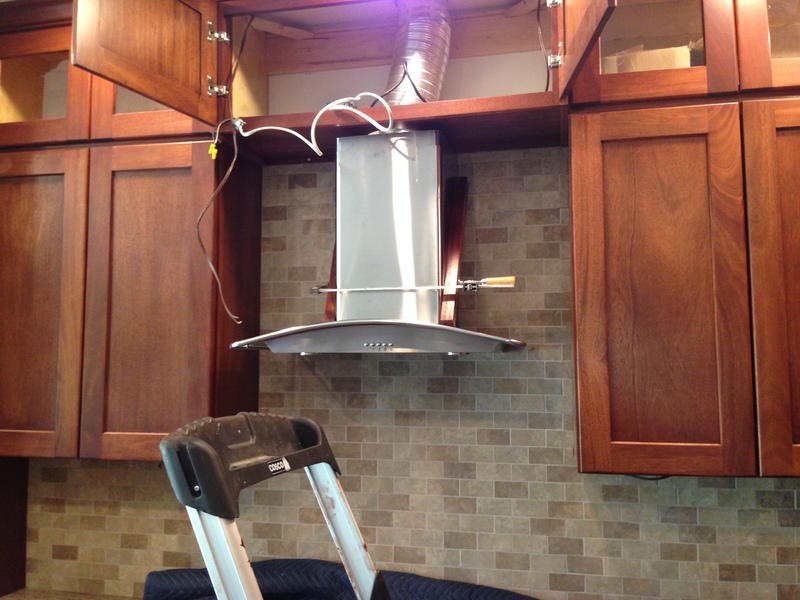 Because of the way the cabinet above the exhaust fan is situated, Bill now has to put some moulding around the top of the exhaust fan where it meets the cabinet bottom. Always something you don’t plan on doing. To prepare for the electricians to come on Thursday, July 3, Bill and I tested every outlet and light switch to see what was working and what wasn’t. We had a problem with almost every room except the bedrooms with how they installed the light switches. 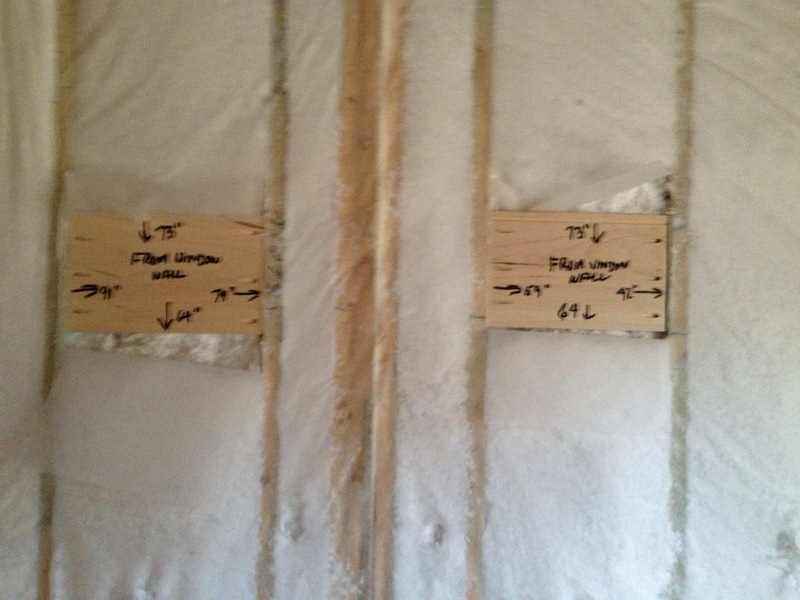 Before we ever had electrical rough-in, I had put labels with what I wanted in the order I wanted for switches and stapled them next to the area where they would be installed. Well, they got the switches for the correct items installed; however, the order of the switches were either random or backwards. Very frustrating. For example, when entering the garage from the house, I wanted the first switch to be the interior garage lights, then exterior garage lights, and then the attic lights. What we got was attic lights, exterior lights, interior lights. Don’t mean to sound picky-picky, but we tried to think through how we would live in this house and what lights we’d be using the most and where to put them. 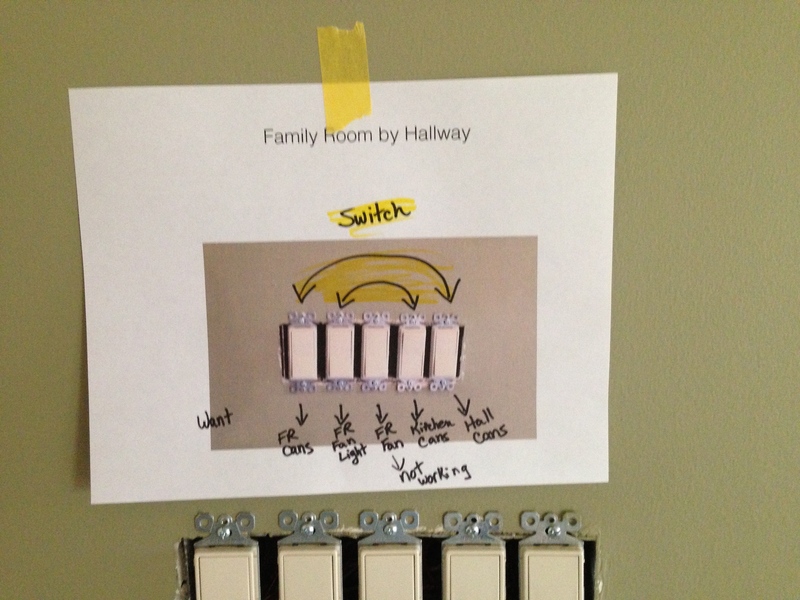 So, I took pictures of every run of light switches, printed them out and marked how I wanted things switched. 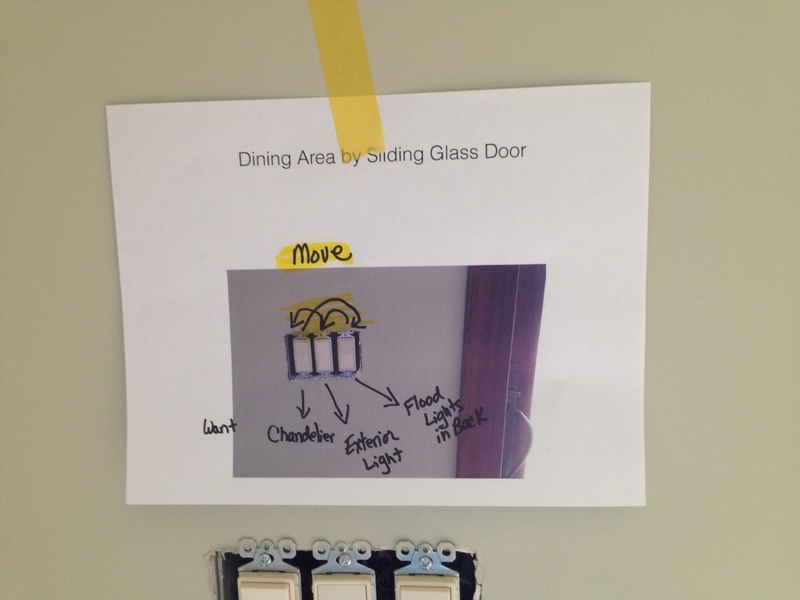 And, I printed out a separate punch list for the electricians to work off from. Here are two of the light switch issues. The house is dotted with these photos hung up above the switches. Bill had to get his pole barn ready for electric, too. He worked really late on Wednesday to prepare for them. He had labels stapled to walls throughout the pole barn. He was so excited at the end of Thursday to finally have lights he could turn on with a switch and half of the pole barn wired and working! Goodbye long extension cords running from the pole barn to the house laundry room door. I had originally bought two of these LED exterior lights for the new house at Costco before we left Indy. I loved the look of them. We had planned to use them as the front porch lights. However, before we had our electrical rough-in months ago, we decided we wanted to install lights outside the garage, too. I tried to see if I could buy two more of these lights. Costco didn’t carry them anymore and Amazon had them for double what I paid at Costco. But, the biggest kicker was everyone was returning the lights to Costco according to the reviews. There was failure on many of them just after a couple of months. Bill and I decided we didn’t want to risk replacing them on the house before we even moved in. 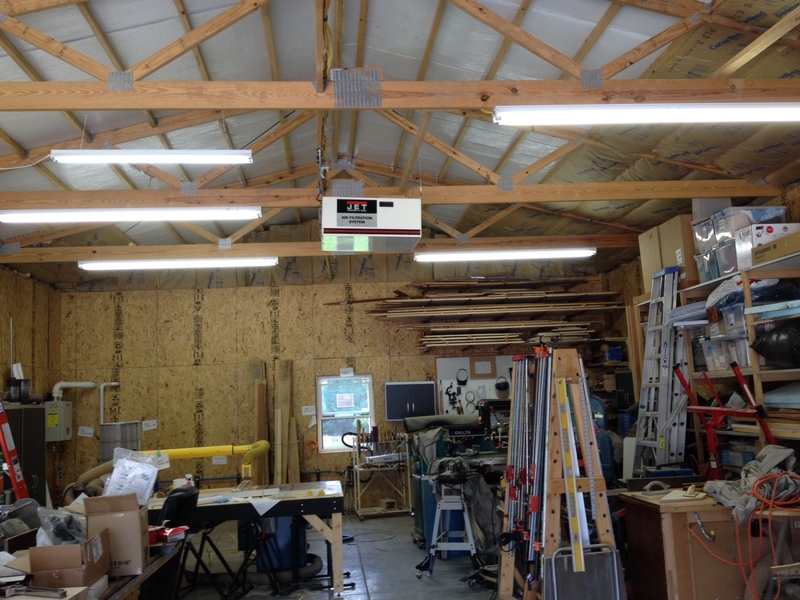 So, we decided to install them on the pole barn. Bill is very happy and keeps teasing how nice they look. I just hope they don’t quit working! The electricians are returning on Monday, the 7th, with a large crew. We only had two guys on Thursday. 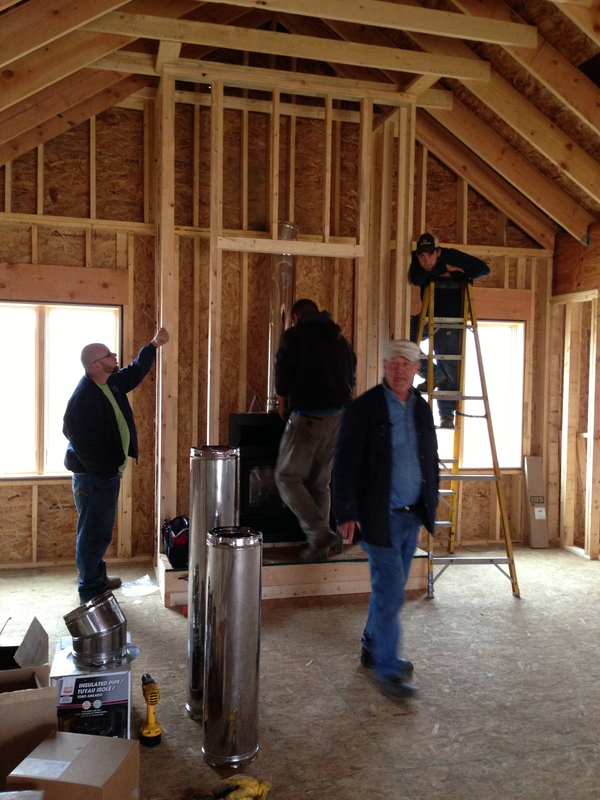 They will finish the pole barn and house then and call for our electrical inspection. 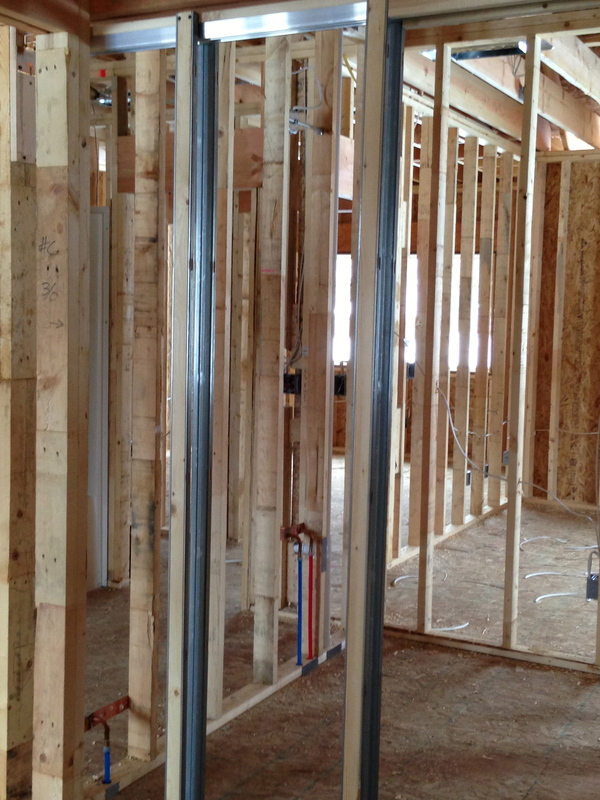 Monday, July 7, electricians to finish house and pole barn and inspection called in. 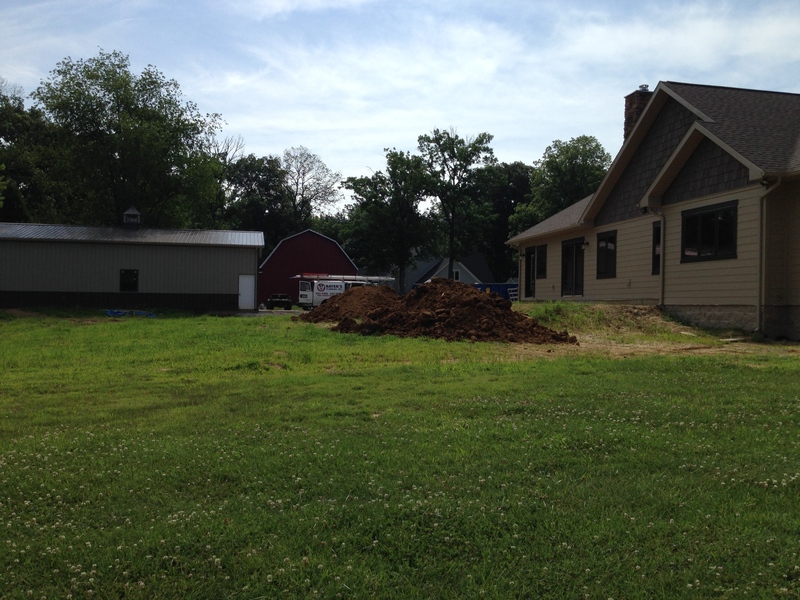 Tuesday, July 8, plumbers to finish house and pole barn and inspection called in. Wednesday, July 9, carpet installed in the bedrooms. 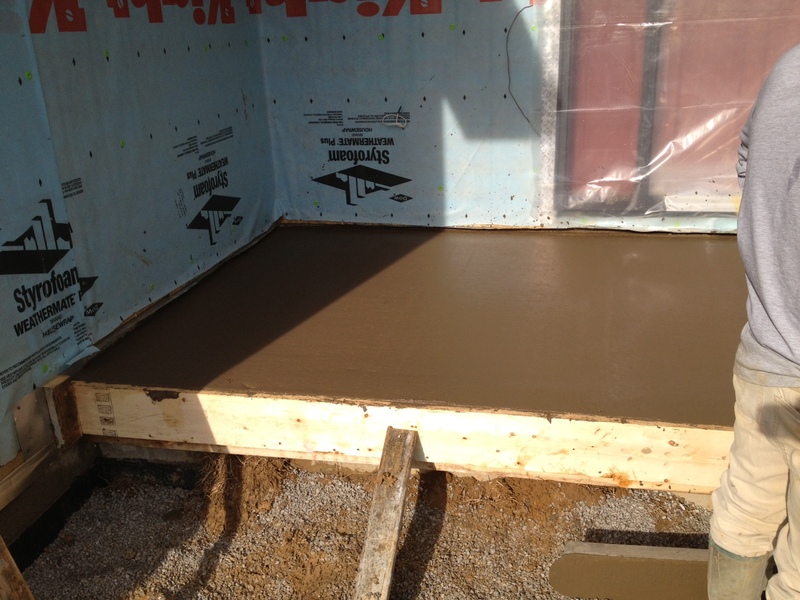 Wednesday or Thursday, July 9-10, colored concrete poured for walkway from garage to front entry and for back patio. Thursday, July 10, post-construction cleaning crew coming to clean the house, top to bottom. If they don’t finish, they’ll return the next day. Friday, July 11, window cleaning crew to clean windows and glass doors inside and out. By Friday, hopefully final inspection approved and certificate of occupancy received. Saturday-Sunday, July 12-13, move all our furniture and boxes and bins from the storage units to the house. Saturday, July 12, new dining chairs being delivered. Sometime we need to put together our new dining table! Monday, July 14, family room furniture, rug, and king mattress and box springs delivered. Week of July 14, start unpacking and moving things from Jill & Jim’s to new house. 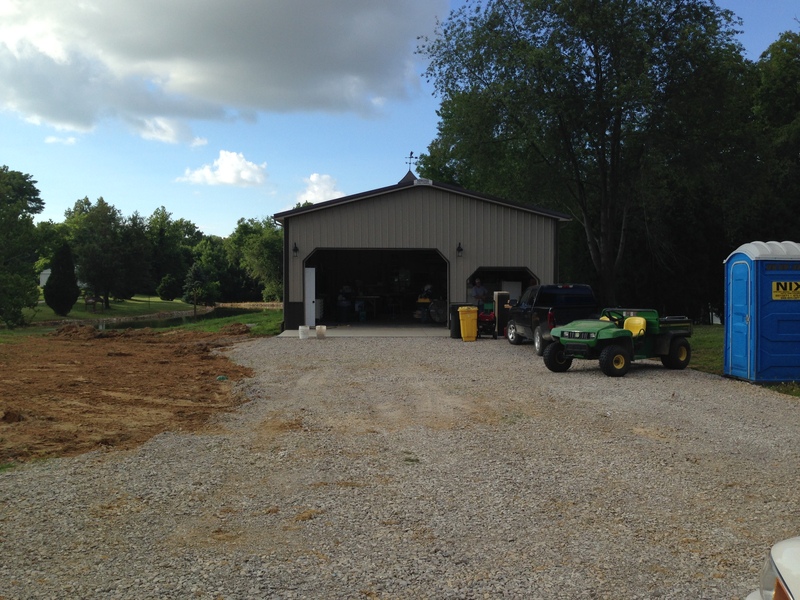 Wednesday or Thursday, July 16-17, concrete driveway and walkway from back patio to pole barn poured. Whew! Lots to do in-between the above, too! We’ll probably move in without a lot of things done only because there is only one Bill. I’ve always known I’ve relied on this guy to do just about every handyman thing there is to be done throughout our married life. I just wish he had a crew of his own. We eventually will get our garage doors replaced and it’s really okay if it’s done after we move in. And, we had one of our shakes blow off during the last storm. Apparently, someone didn’t install that one very well! This will more than likely be my last entry until after we move in. Plus, phone calls to get internet service weren’t successful last week. I was told by AT&T that they do service our area (Jill & Jim and Joan & Jim have AT&T service), but there are no more ports available for new customers! Jim has a couple of friends at AT&T and has already contacted them. We’ll wait and see if they can help us out before I research other ways to get the web. I hate to think I’d have to do everything on my phone. Blah! And, if I may ask, please send all good vibes this way and prayers for our strength through this final stretch! Thank you to all who have followed us through this journey! Deck the Halls with Wires and Sawdust, Fa La La La La, La La La La! Tis the season to be jolly, fa la la la la, la la la la! Not only is this the season to be jolly, it’s the season to be BUSY! We’ve had some ups and downs, but we are getting a lot done on the house. When I last posted, we were supposed to have the HVAC contractors, siding guys, and the cabinet guy come the next week. Only one person (Rick from Lensing for the cabinets) showed up on Monday, November 25. He measured and looked like everything was going to work out just great . . . until he left. 😯 Key the drama button. Duh duh duh duh! I got back up to Jill’s house and Bill asked me if I told Rick that we were going to have stone all the way back to the wall on each side of the fireplace. Uh, No!!!! I forgot to tell him that! 😡 I quickly gave Rick a call. Rick had done Jill and Jim’s window seat on one side of their fireplace and kid’s computer desks on the other side. He was going on the basis of how they stopped their stone just around the edge of the fireplace since they had cabinets on each side. We estimated how thick the stone would be and made the window seats shorter than he measured. He was going to draw up plans and send to me for approval before he ordered them. Here is a snapshot of the window seats. I decided to go with drawers instead of doors as I thought we’d use the drawers to store blankets, throws, etc. Tuesday, Nov. 26, the siding guys showed up. The siding had not been delivered yet. That was a blessing in disguise. Turns out the siding guys said they could not install our siding until our electricity was installed. Really? 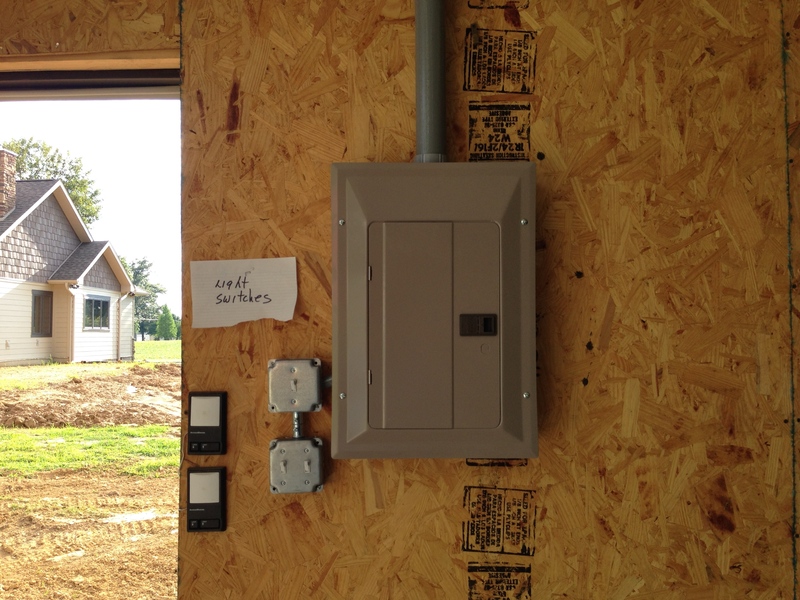 Did no one ever mention that the electricity needed to be installed prior to the siding installed? At one time we were going to have the electricians come right after plumbing but that didn’t happen. The siding guys said that since we were installing flood lights on our fascia, the electricity would have to be run before they could install siding. Jim questioned why they couldn’t start at the bottom of the house and work their way up; but, they said they preferred to wait until all electricity was run. Some things are just meant to be. I believe that is what happened in this case. 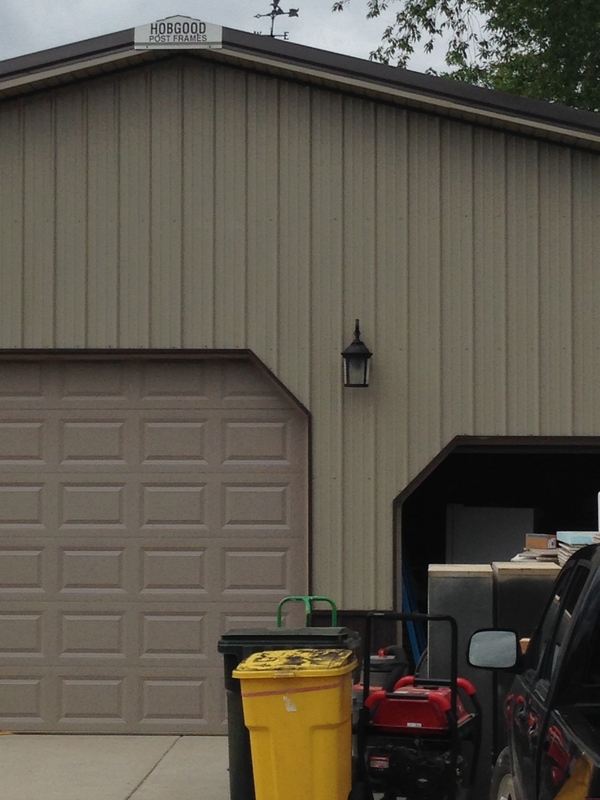 The siding guys did a few preliminary installs on the corners of the house and called Benthall Brothers (our Hardie cement board distributor) to hold off delivering the siding. And, then they left. Jim called our electrician to see what his schedule looked like and when he could pencil us in. Fred (electrician) said he was on a big job and had a couple more scheduled after that but probably could not get to us for a couple of weeks – around the second week of December. 😦 Yikes! Everyone was beating their heads thinking we really should have scheduled the electrician before now because we couldn’t move forward until that part was done. But, Bill and I found out there was still lots we could do before he arrived. It was Thanksgiving that week, and I had some Christmas shopping to do, people! 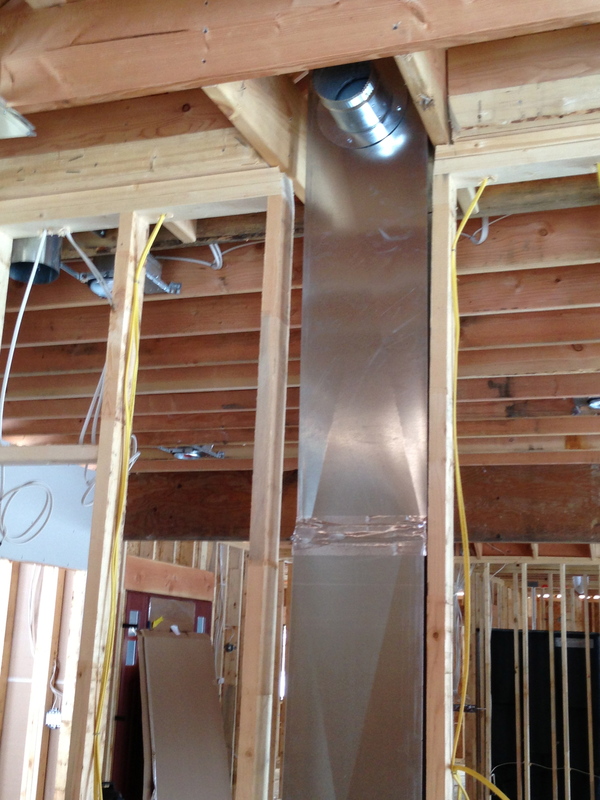 The HVAC guys came back to finish up their rough-in work on Wednesday, Nov. 28. I don’t have many photos of that. 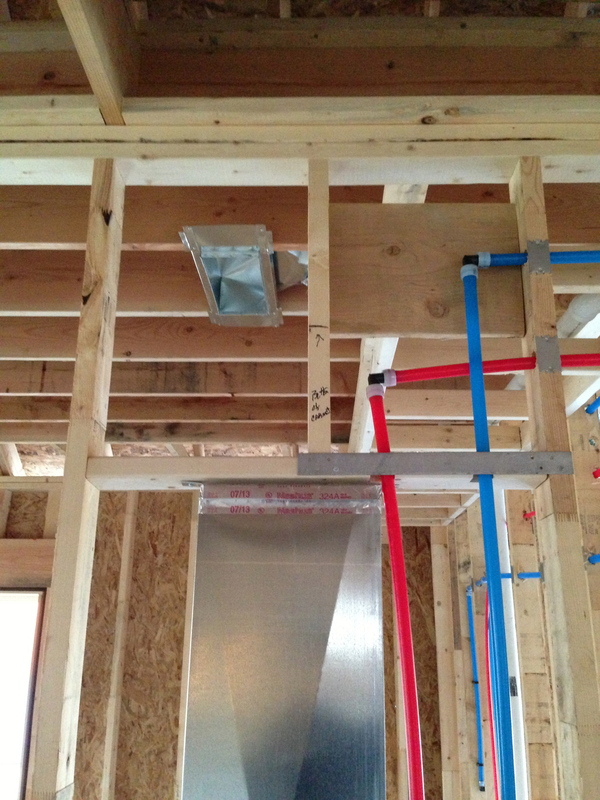 Not much to look at but some vents and tubing for the exhaust fans in the bathrooms. 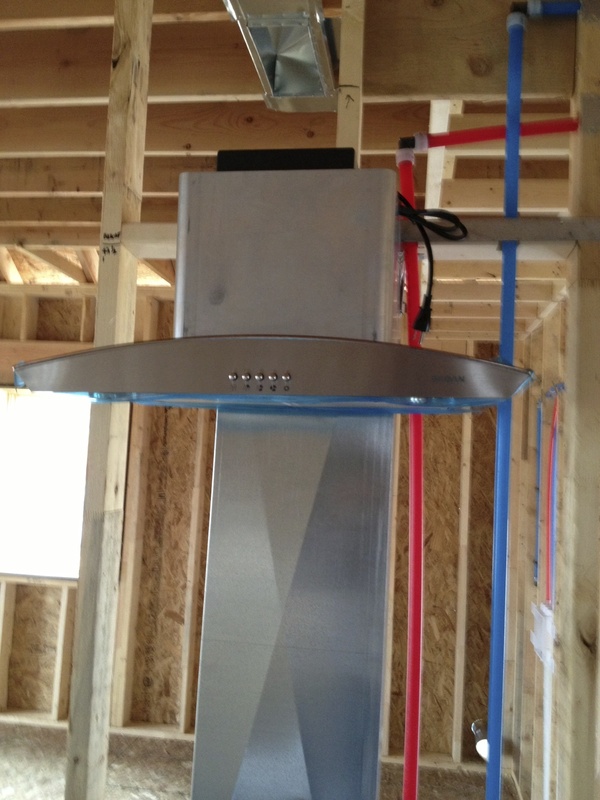 What I did take pictures of was the venting done for the kitchen chimney range exhaust fan. 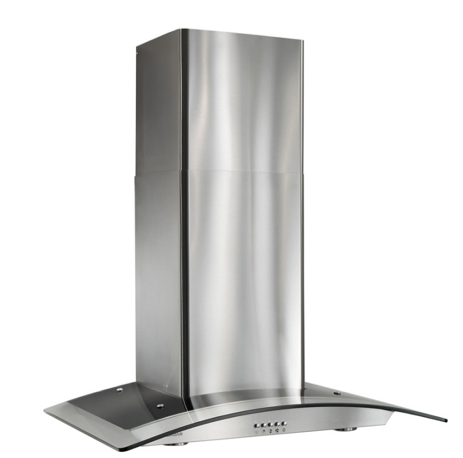 Our exhaust fan looks like this. So, the HVAC guys decided to vent the exhaust fan down, through the crawl space, and out the side of the house. They said they didn’t want to go all the way up through the roof. So, this is how they roughed in the venting. I kept telling Bill I just didn’t think the venting made sense to me the way it looked. He said something was off. 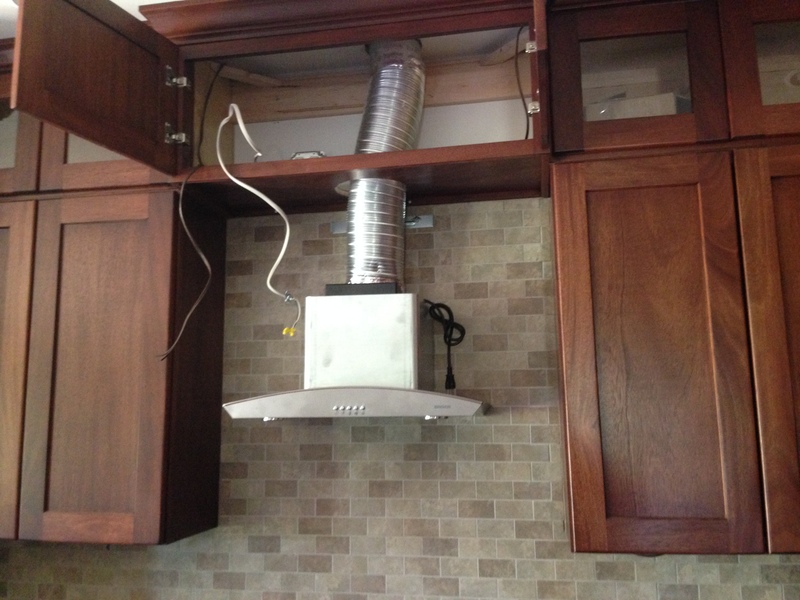 We had a 17″ tall cabinet going above the vented area. We didn’t think things were right. We decided to wait until after Thanksgiving and see if Bill could figure out if the venting was correct or not. In the meantime, Bill said for me to be thinking where we might want electrical outlets and switches for our lights and fans. 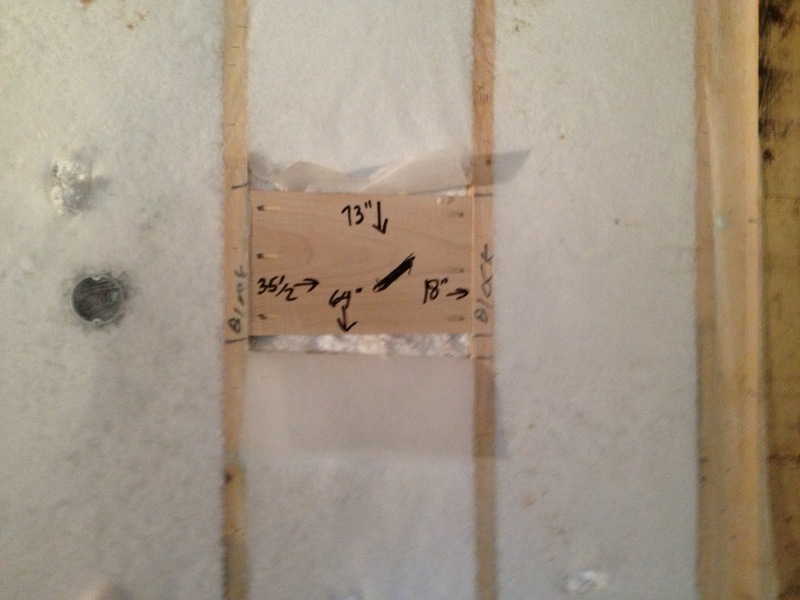 He wanted us to do our own walk-thru and mark where we wanted things placed before our walk-through with Fred the electrician. OMG, making all those decisions was a long and hard process. 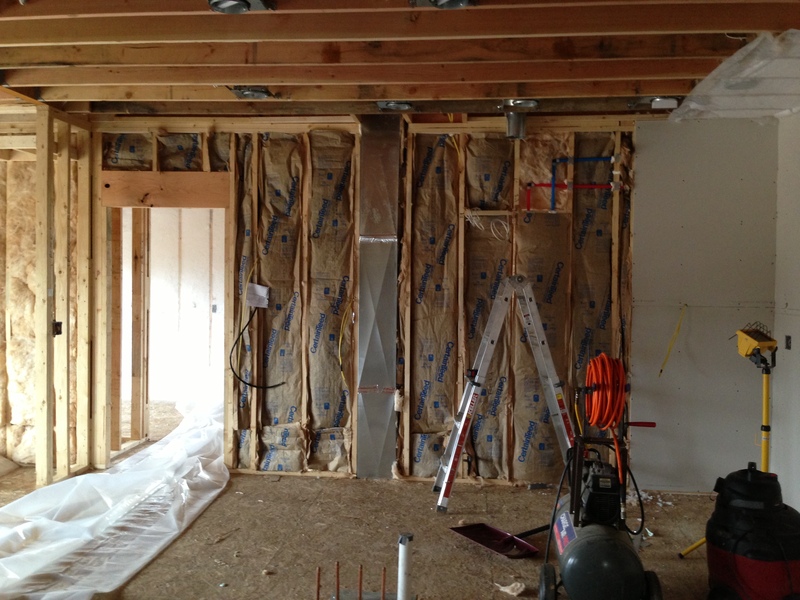 Yes, we had an electrical floor plan – but that was where light fixtures, can lights, exhaust fans, ceiling fans, and exterior lights would be installed. So, I got out my floor plan from my 3D software which had furniture placed in it to decide where I might want those outlets and cables for digital phone and TV and where I wanted CAT5 cables run for Internet. 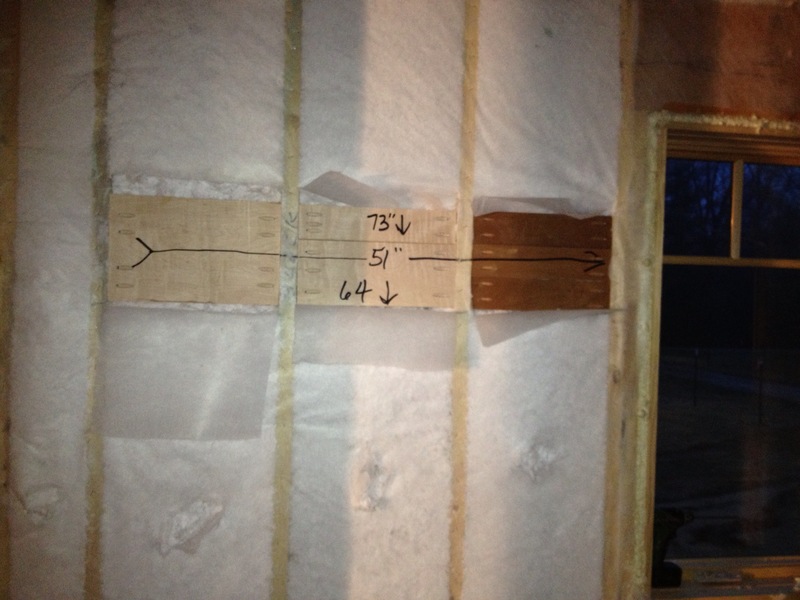 Bill & I worked on this project several days marking up the house and stapling labels on the studs. 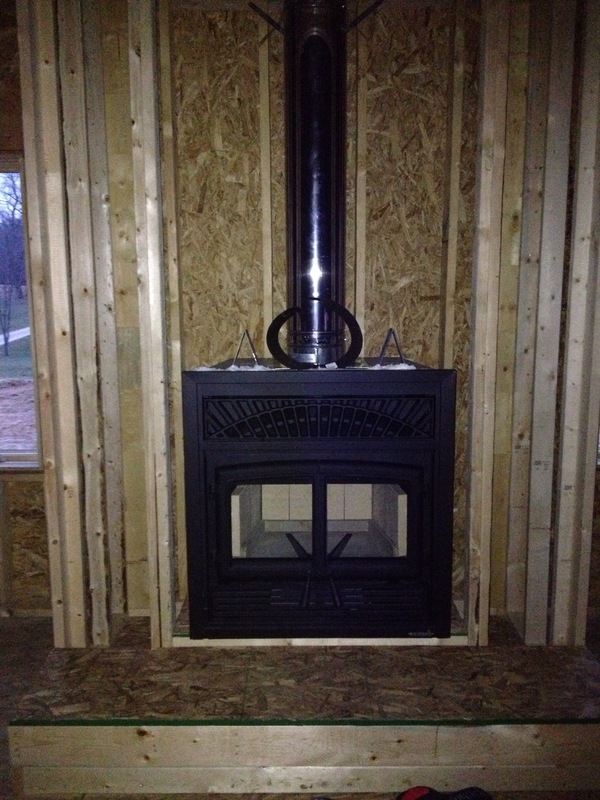 On Tuesday morning, December 3, the fireplace installers arrived. 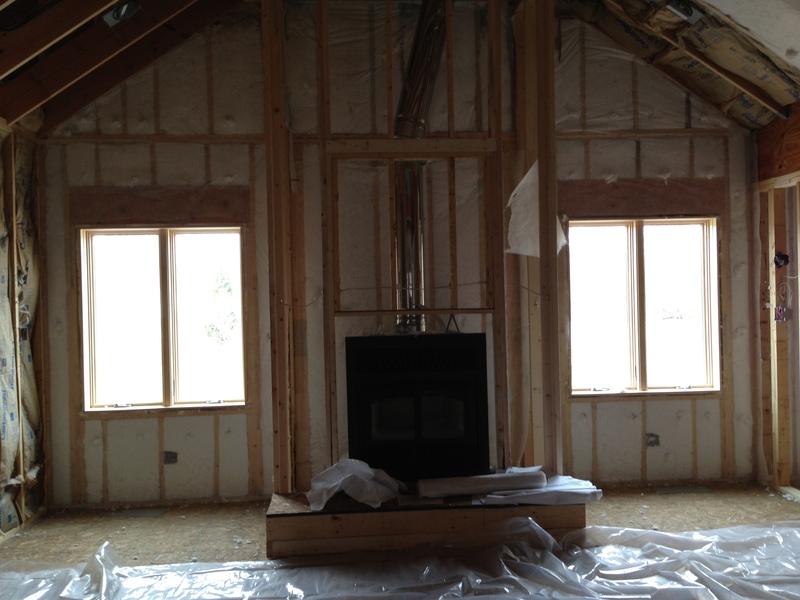 It was great to see the fireplace inside the frame. While the fireplace was being installed we had a planned walk-through meeting with Mark from Wood Specialities by Fehrenbacher. Mark has worked with us for well over a year in creating a custom baseboard, selecting wood trim for our windows and doors, selecting a design for our wooden interior doors, and headband and beam design for the family room ceiling. 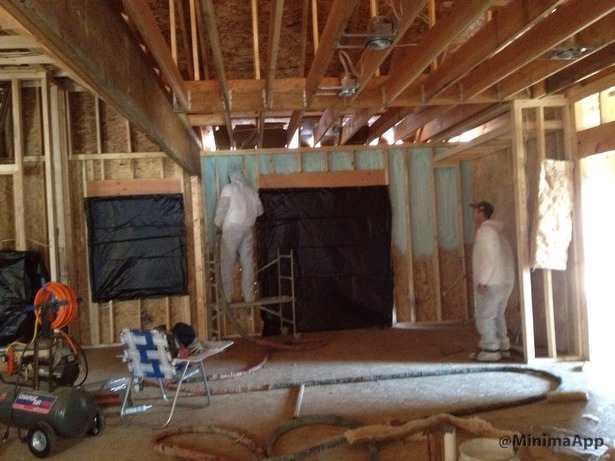 He gave us some ideas about transitioning from the 9 ft ceiling entry to the vaulted section of the family room. And, we were able to discuss material for a double mantle for the fireplace. He measured everything in the whole house. He said he’d send us a new quote for everything within a week or so. He did ask if we had picked out a stain color yet. I told him I was waiting for our front door to be installed so I could see the color. I wanted the stain color to match our front door and the cabinetry throughout the house. 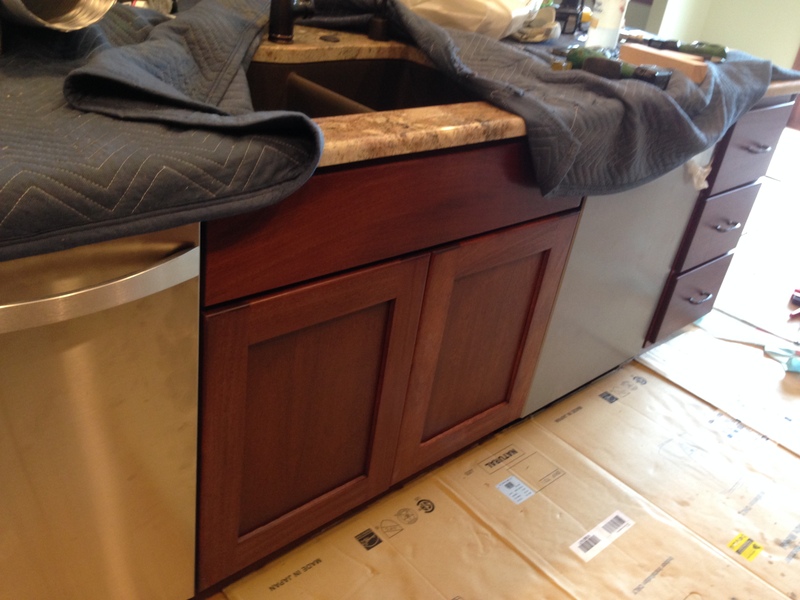 Mark said once we picked out the stain color, he would need some of it to put on the interior door sections that might expand – prior to the painter doing the staining. 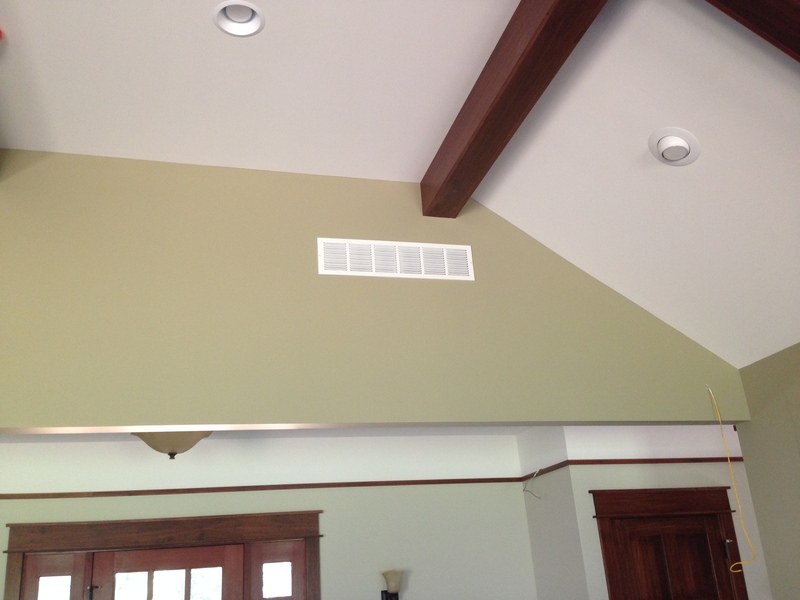 Bill called our painter Mark and asked him about stain and how we went about picking out a color. 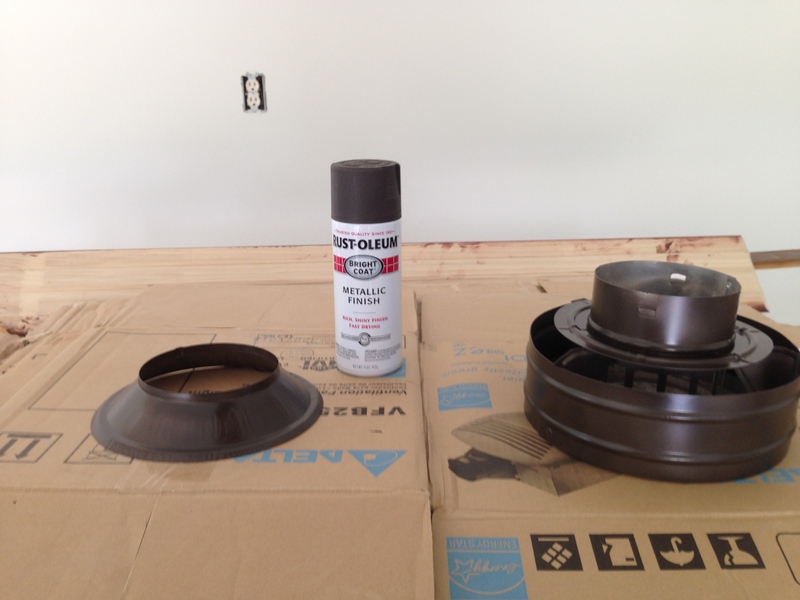 He said he liked using Zar wood stain and asked that we go pick out a color at the Newburgh Benjamin Moore store. We put that on our to-do list. 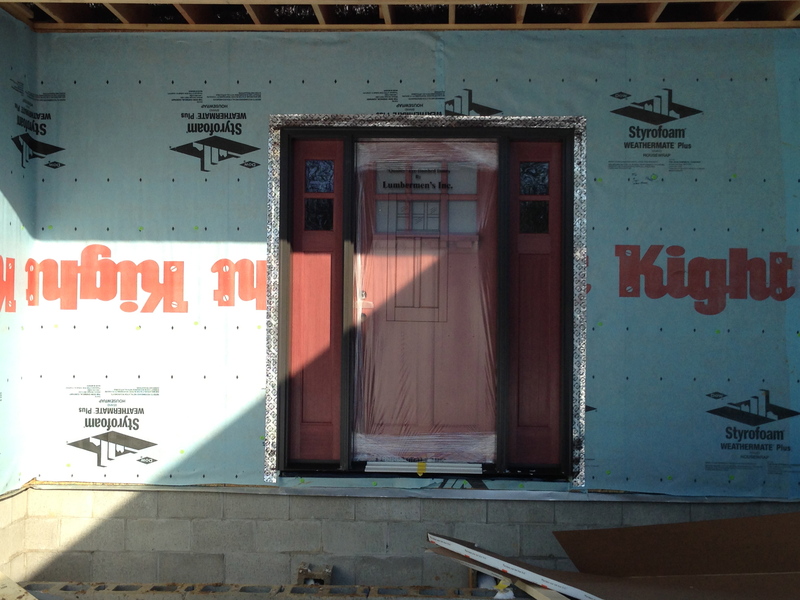 Our front door had been delivered, but we were waiting on the framing crew to stop by and install it. You couldn’t see what the door looked like because it was totally boxed up. I think it was late the next evening that framer Greg and his crew came and installed our front door and the pocket door mechanism for the master closet. Earlier in the week, Bill got back to looking at the venting for the range fan. He ended up getting the fan out of the box, going through the installation guide, and temporarily tacked it up to where it should be installed to see if the venting the HVAC guys would work. Here’s what he found out. The venting wasn’t going to work as it. It needed to go up a lot higher. Bill text Jason the HVAC guy along with the photo above and asked if he would please come by to discuss how it could be changed. 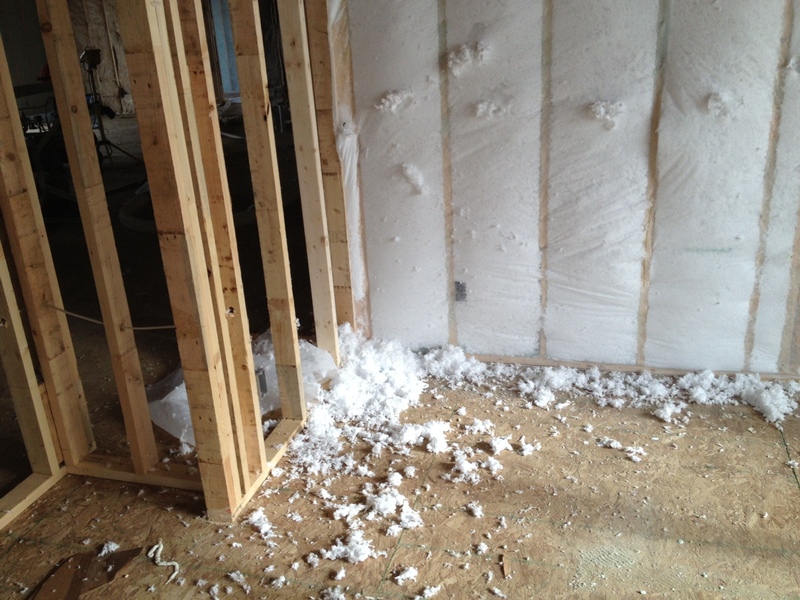 And, he said it needed to be changed before insulation was put in. More on this later. And, while we are talking about HVAC, Jason had asked us a couple of weeks ago if we wanted to take the federal tax credit for the geothermal unit in 2013 or in 2014. The Federal credit was 30% of the cost (with no upper limit) and that included installation of it all, too. Bill and I decided since 2013 would be our craziest year for taxes (Bill retiring, both of us going on Social Security, taking out monthly retirement allocations, Medicare, selling a house, and building a new one), we thought it would be best to use the tax credit for this year. However, to do that, we had to be billed for the geothermal unit and pay for it in 2013! It was December and we had to send in our December construction draw to the bank by December 5 to get money to pay contractors by the 10th. Bill made all the phone calls and did the leg work and got an invoice for everything just in time to turn it in to the bank! Whew! Then the weather took a dive. Thursday afternoon, December 5, we went from freezing rain to ice to snow. 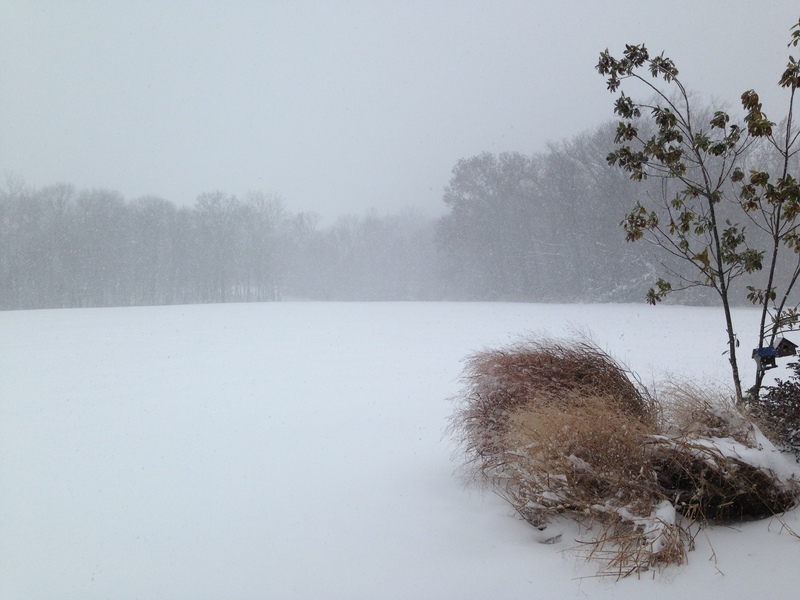 Friday, December 6, it snowed all day. We ended up with over 7 inches of snow. See, it was a huge blessing that the siding was not delivered. That would have been a mess! Needless to say we had nothing going on down at the construction site until the following week. 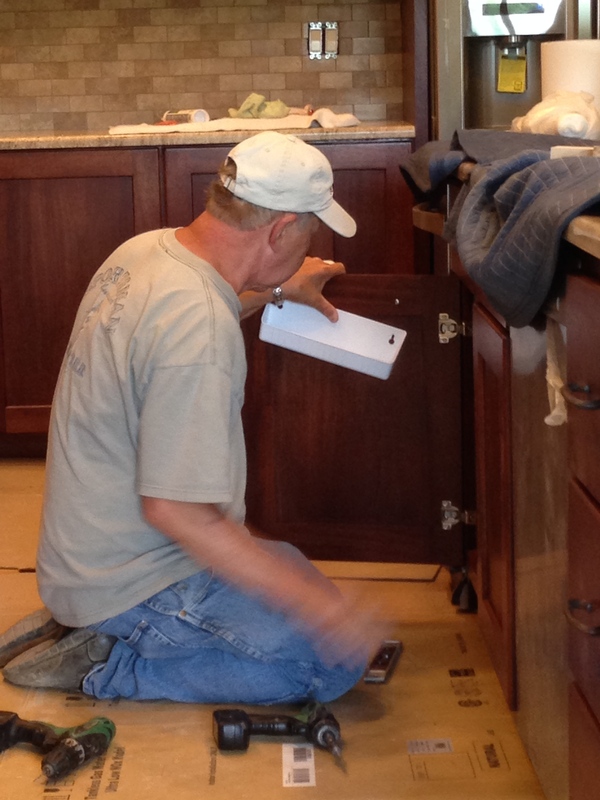 During the snow hiatus, Bill was able to work on the cabinets a couple of days. 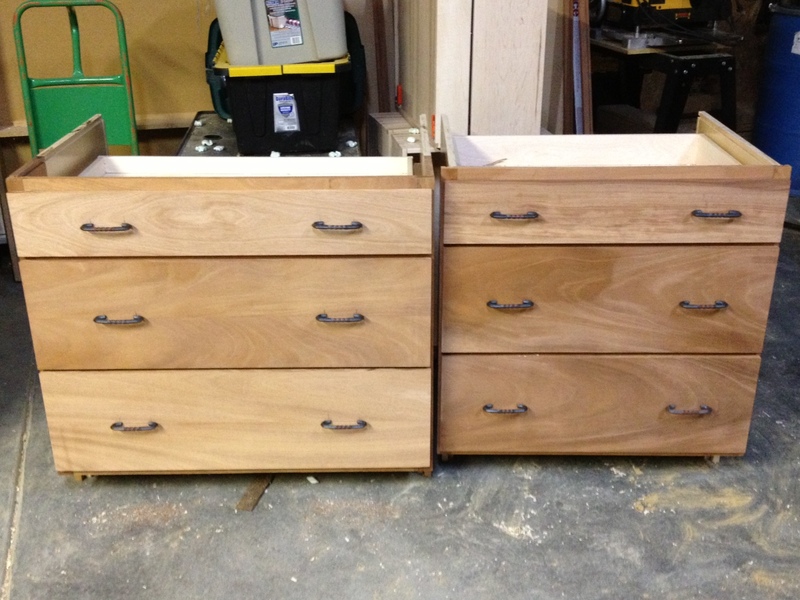 He finished all the drawers and drilled the holes for the handles. Fred the electrician called and we scheduled our walk through with him for Monday, December 9. 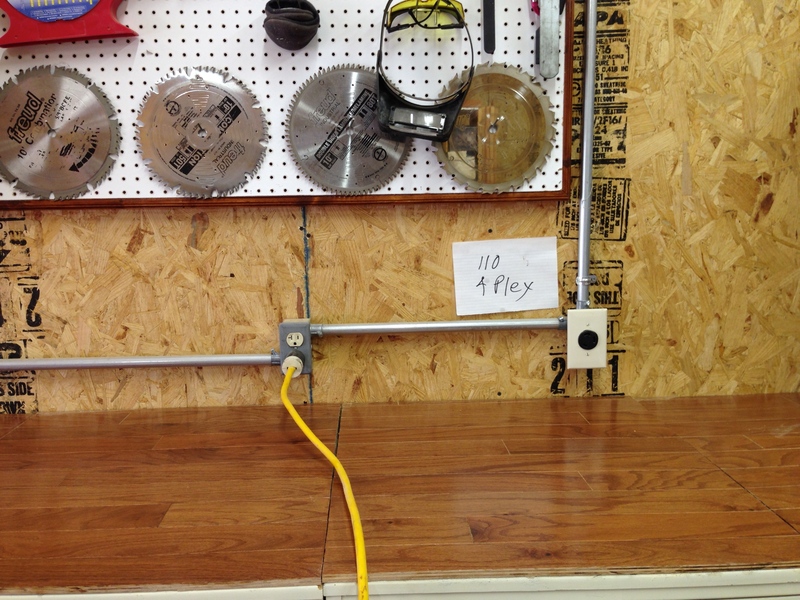 He was impressed with all our work we did marking what and where we wanted outlets. 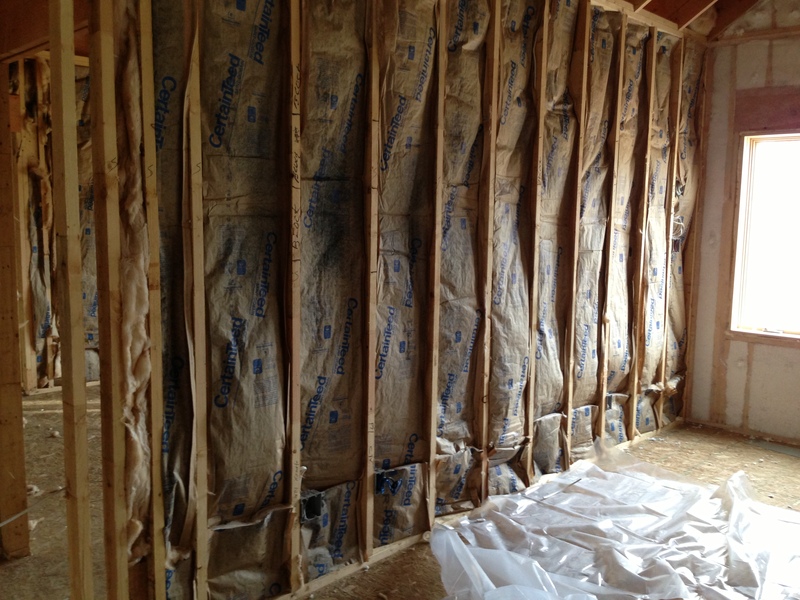 He made his markings on the studs as we went from room to room. Oh, and I decided to make the exercise area in the laundry room my computer area instead. 🙂 I made sure we had lots of outlets and cabling for that area. Fred said they would be back on Tuesday or Wednesday to install it all. 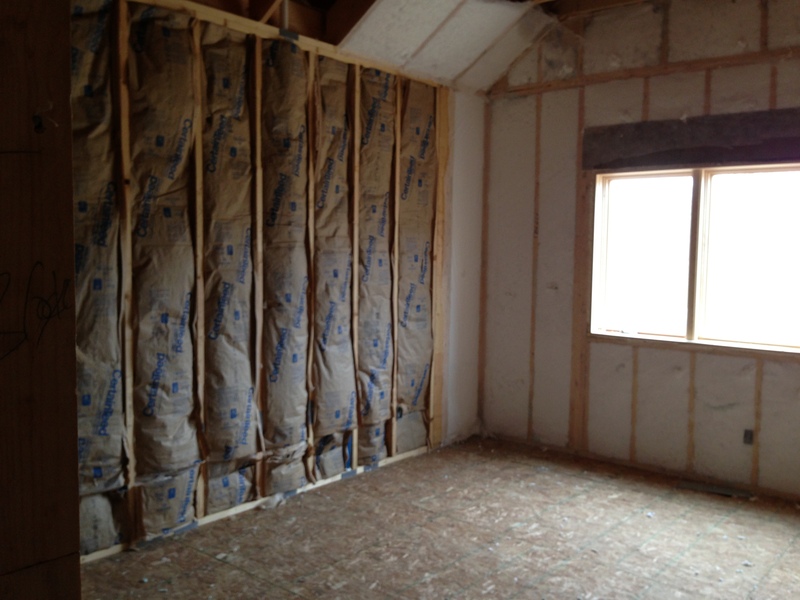 In the meantime, Bill had made arrangements with the drywall guy Bart and Les the insulation contractor since they were next up after the electrician in the interior. Bart had to install some drywall on a couple of walls between the kitchen and garage and the laundry room and garage before Les could install foam insulation in those areas. Bart made arrangements to have some drywall sheets delivered. 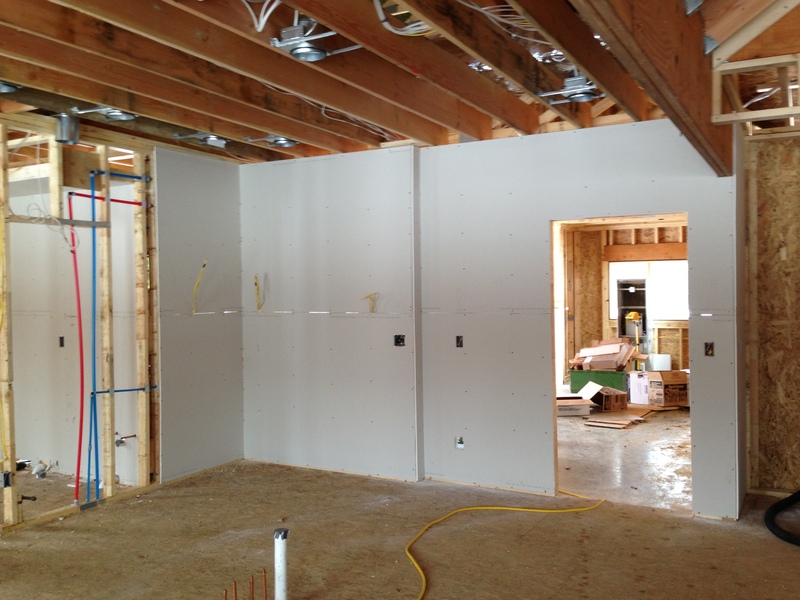 The drywall was delivered on Monday, Dec. 9. Bill called Bart and he said he’d be out as soon as he could. Jim called the siding guy and told him that the electric had been roughed in. He said they were working on a job and had one or two jobs afterwards. He said it might be Christmas week or after before they would get to us. 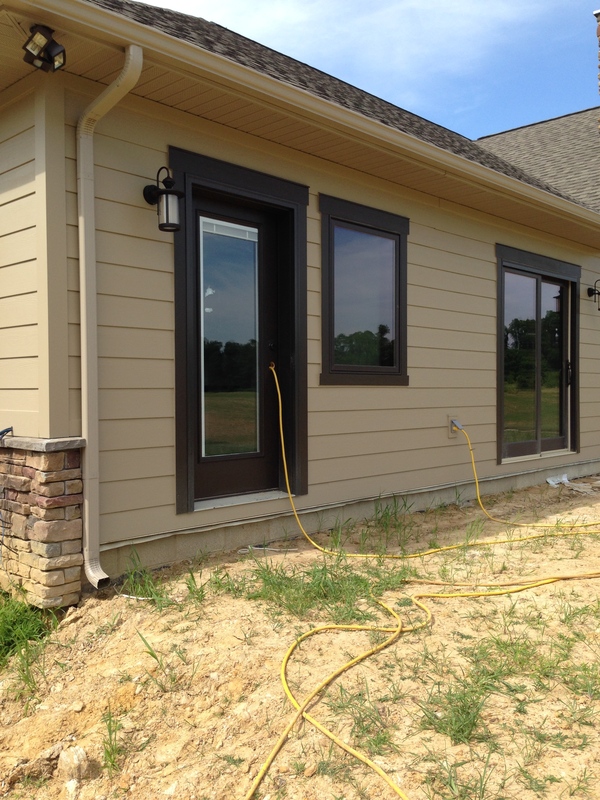 Then we talked about the possibility of getting the front porch poured before the siding was installed. Jim called the concrete guy to find out his schedule. He said that in the winter they prefer not to “blanket” colored concrete as the finish doesn’t come out as well. So, he said that if the temperatures didn’t get below 26 degrees for 4 days in a row after pouring the concrete, he could pour it for us. So, Jim told us to keep an eye on our weather app. So, no one showed up on Tuesday, December 10. The electrical crew arrived on Wednesday the 11th. They were by far the messiest crew we cleaned up after; however, they were the quickest! They installed it all in less than a day! Bill called me when Fred said he couldn’t really install as many can lights above our island as was on the electrical plan. He said they would be too close together. Bill wanted me to come down and “approve” the change. It was a good thing I went down there. I found a couple of things that were not installed correctly. The fewer cans above the island was fine. However, I noticed that where the guys had installed the switches for the lights by each window seat were so low that I would lean on the switch with my back. I asked that they be moved up. And, I also noticed that the vanity lights connections looked too low. I asked Bill if Fred had gone by our spec document for the installation location for the vanities. He said he didn’t know. I grabbed the document which we kept in the house and checked to see where the lights were to be installed. We have tall mirrors for the bathrooms and Bill and I had measured cabinets, granite, backsplash and mirror months ago to determine height of the lights. We talked to Fred and he brought his tape measure and sure enough the lights were about 6 inches too low. Fred had everything fixed before they left. The next day the temperatures dipped all day to single digits. 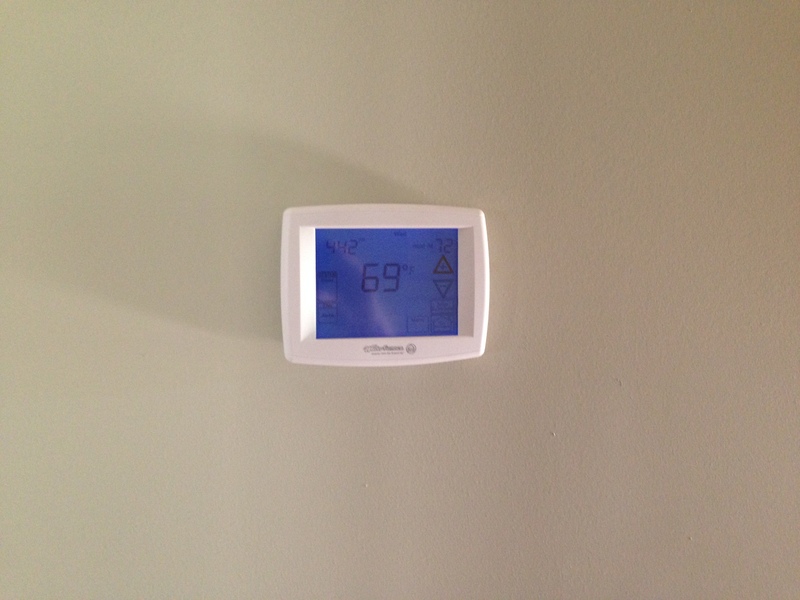 Bill and I went down to the house to double-check if all the electrical outlets and switches were correct and in the right location, but it was too cold to do it. So, Bill and I spent the day running errands for the new house. We went to Benthall Brothers to pick out our garage doors; stopped by Fehrenbacher’s to drop off the signed contract and pick up some sample poplar pieces for staining samples; went to the Benjamin Moore paint store with all our samples to match and picked a stain color; and then went to an electrical supply store to buy wiring for Bill to hook up a large portable furnace to use in our house. I guess it was a good day to get all that done. We figured we wouldn’t have any contractor show up on that day! 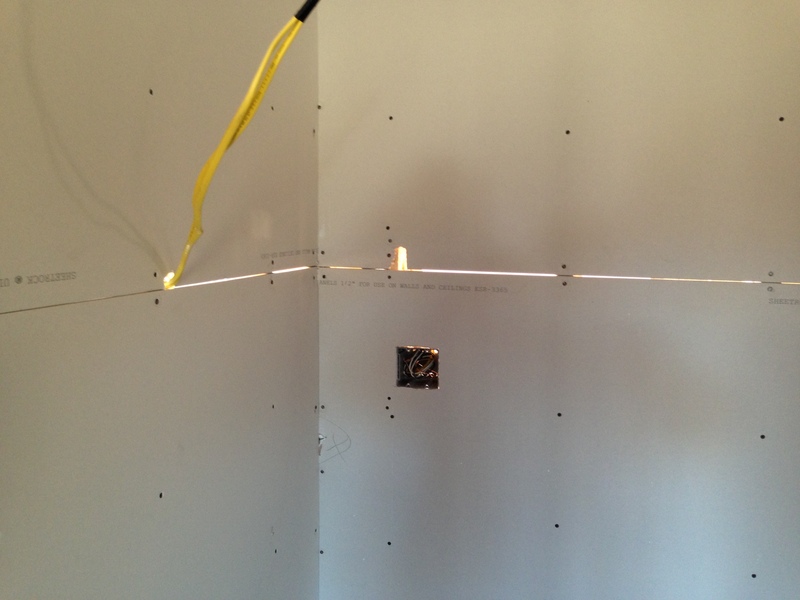 Friday the 13th Bart came and put up the drywall. And Jason’s crew came and looked at the range exhaust fan venting issue. Turns out they moved it over one stud and went up a lot further. Now, that will work! Oh, I forgot to say that when the well guys came several weeks ago they said that there was a little white mold developing in our crawl space. YIKES! 😯 They said we probably needed to get that vapor barrier installed ASAP. Of course, the hold-up was waiting until the electric was run. Not that it was done, that barrier needed to get down. But, it was cold and nasty out. This was one PITA job Bill didn’t want to do. I didn’t want him to do it either. I told him to call a company does that and have them install it. We both checked out companies on the Internet and Bill sent an email to one to inquire what it would cost. They called. They said it would cost approximately $2K. Bill said he didn’t want to pay that much. Ugh! Jim said he knew a recent college grad who worked construction while he was off from school. He asked if Bill wanted him to call and see if he would be interested in working for us. YES!!! Do not stop. Do not pass Go. Just call him right away! And, so he did. Todd said he’d be interested in working for us for several days. He started working last week. He cleaned up the garage and cleaned and vacuumed the house in preparation for the insulation crew on Tuesday and Wednesday for a couple of hours. They were coming Thursday, December 19. We found out Monday that the temps were going to be soaring up into the 40s, 50s and even the 60s that week. Jim said it looked like they could pour the front porch! But, wait. We hadn’t picked out a color yet for the colored concrete. Where and how were we supposed to get that information? Jim said he’d get a brochure from Tony the concrete guy. Monday evening Jim brought home the brochure. He said if we could make a decision of what color by early Tuesday, he would call Tony and they could hopefully pour the concrete on Wednesday or Thursday. Bill looked at the brochure and picked Colonial Red. I said, “No Way!” The color decision was up to me. I had a doctor’s appointment early Tuesday morning so I made arrangements to stop by the stone place so I could match up a concrete with our stone selection. With Rick the stone guy’s advice, I went with a lighter color than I originally wanted. He said from experience he said the darker colors show dirt and scratches more. So, I picked Sandstone for the colored concrete. I called Bill and he text Jim the color and said we wanted a smooth finish. Bill also asked if Tony could add some grit to the sealer so the concrete wouldn’t be as slippery when wet. He said he could! Earlier in the week Bill and I went through the house to see about all the electrical stuff. We found a couple of outlets missing. And I decided to change the under-cabinet outlet wiring in the corner of the kitchen cabinets to a wall outlet. After doing some reading I found that for the appliances that people like to keep plugged in all the time (i.e., coffee pot) having the cords hanging down wasn’t a preference. So, the only appliance that Bill and I keep plugged in is the coffee pot and we had planned on keeping it in the corner. 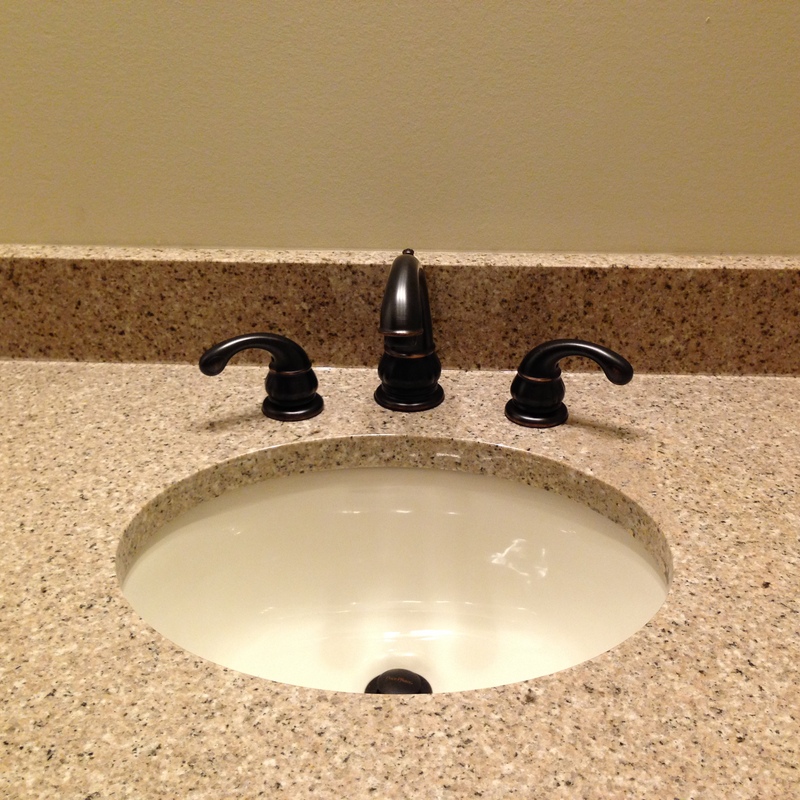 And, I discovered I had made a mistake and had the master bathroom outlets on each side of the vanity placed wrong. The hand towels would cover up the outlet. We wanted those moved. Bill called Fred and gave him a list of things and he said they’d be back out later in the week. The electrical crew came back on Wednesday and had everything done in 20 minutes! I’m telling you, these guys are fast! We had a full house at the site on Thursday, December 19. 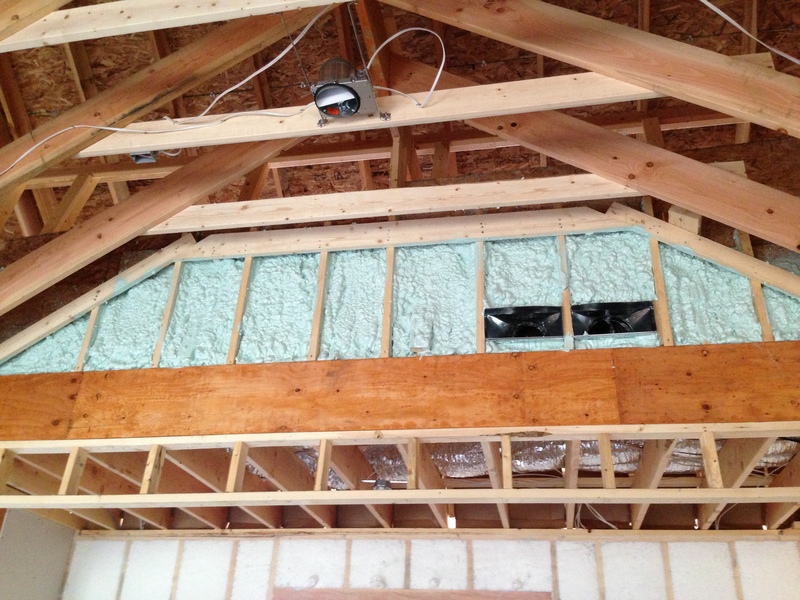 Les came with his insulation crew. 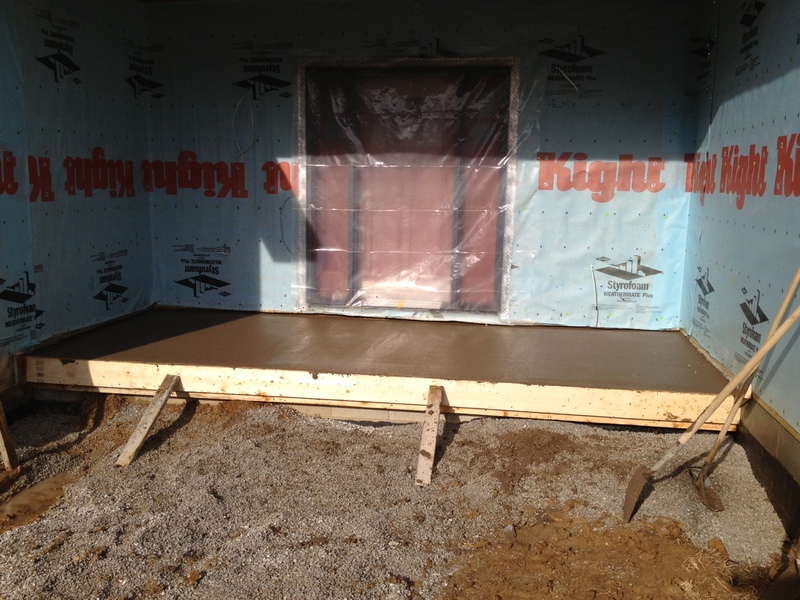 Tony and his crew came on Thursday, too, and poured the front porch. I hope the color is going to be okay. He said we really won’t know the final color until the concrete is sealed. He said they cannot seal it for at least seven days. I’ll keep my fingers crossed that it will all match. Bill called Todd in the afternoon since he had not shown up yet. There was a communication error. Todd thought Bill was supposed to call him when he wanted him to come out. So, Todd worked really late Thursday night in the crawl space. He also worked most of the day Friday, too. He is just about done installing the vapor barrier. Bill said he is doing a great job. He is supposed to come back today and clean all the mold with Borax and then he will be done. All the snow and ice melting last week from the high temps and 4 inches of rain over the weekend has caused a muddy mess down at the construction site. Bill spent the weekend putting up blocking for anything we might hang – pictures, cabinets, TVs, grab bars, towel racks, etc. With the holidays approaching we are not sure if anyone will be working this week or next. I guess we will see what Santa brings our way.